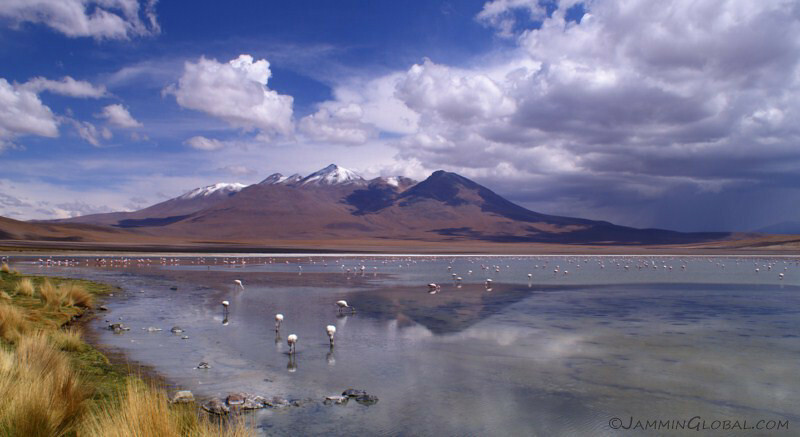 From Laguna Colorado, the southern third of the Lagunas Route takes you through some active geysers and hot springs before exiting at Laguna Verde and into Chile. 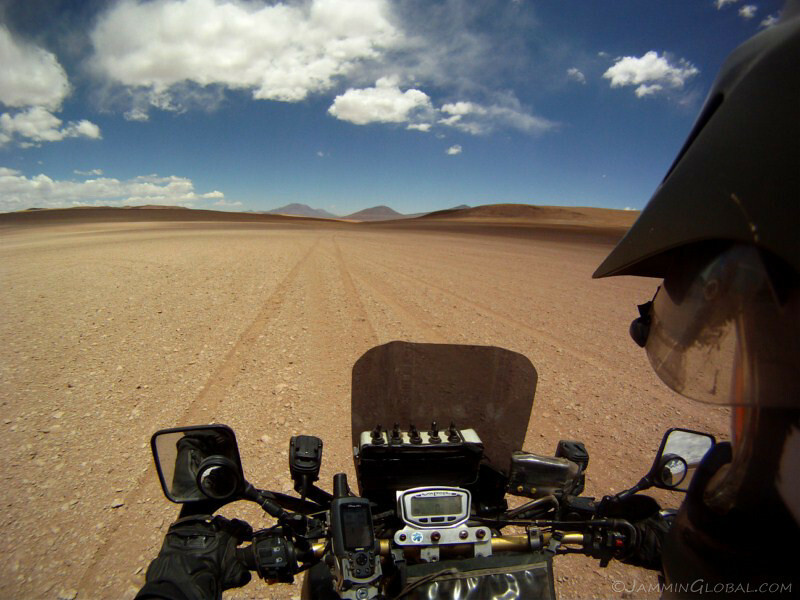 Setting off from Laguna Colorado. 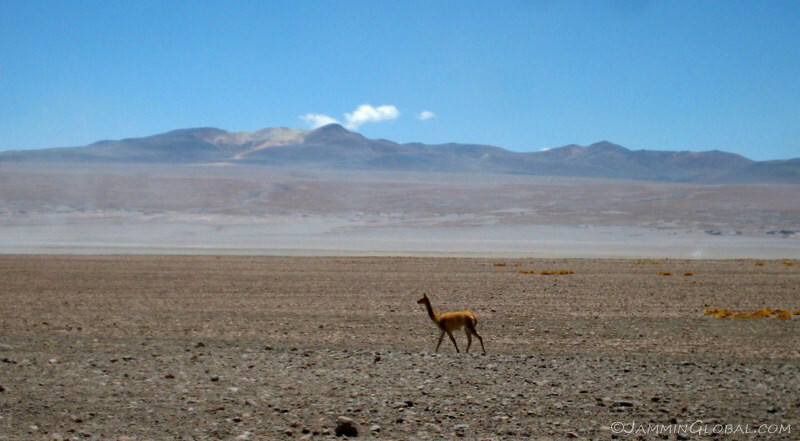 A vicuña strolling by in its homeland. Good thing it has no natural predators, cause there’s nowhere to hide. 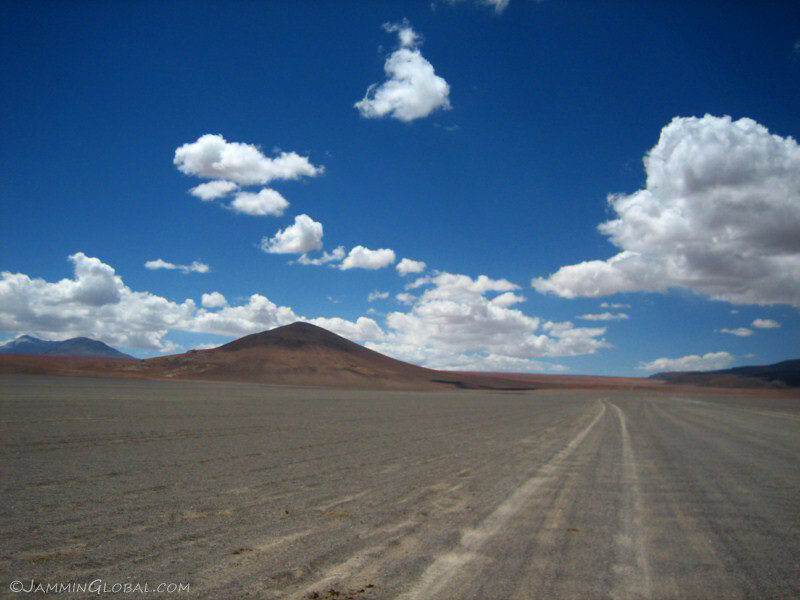 A pebbly track. 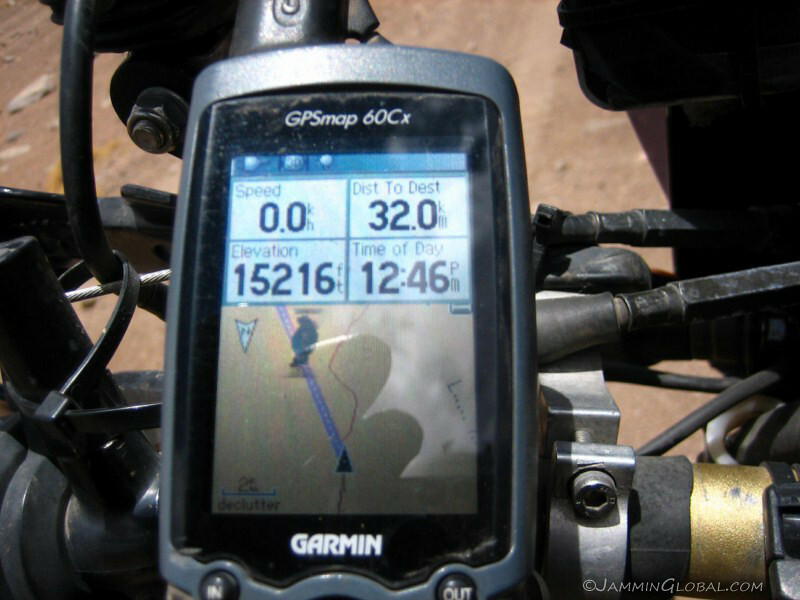 I made sure to put a few psi back in the tires after the deep sand north of Laguna Colorado to avoid any punctures. 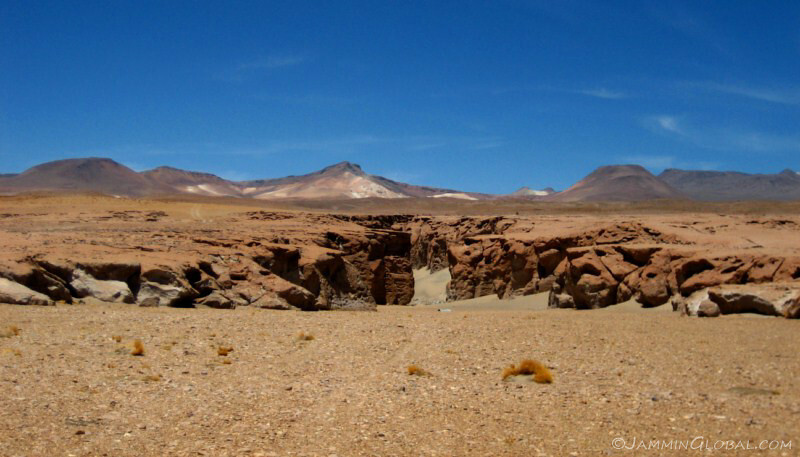 A crack in the earth’s crust forming a small canyon, which was a departure from the usual landforms in this area. 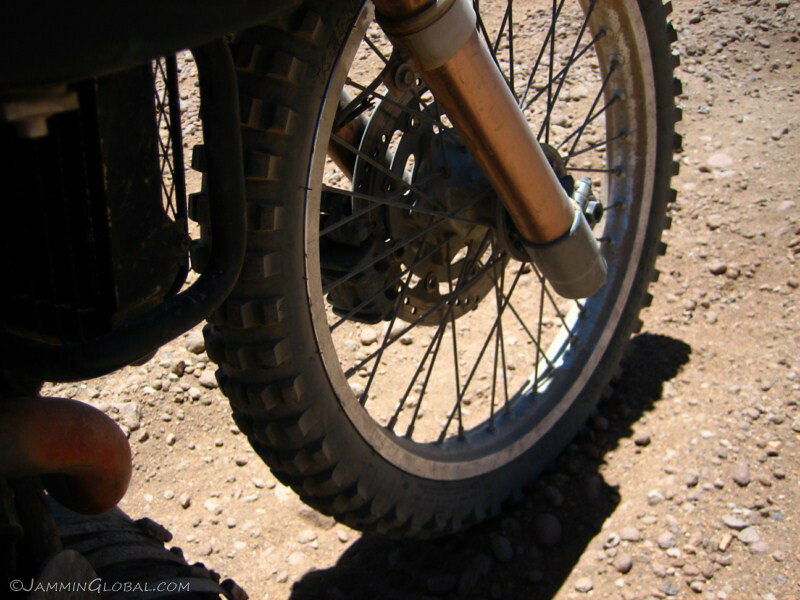 The kobby Kenda K257D did well in this terrain, aired down to spread the load and soften the ride. 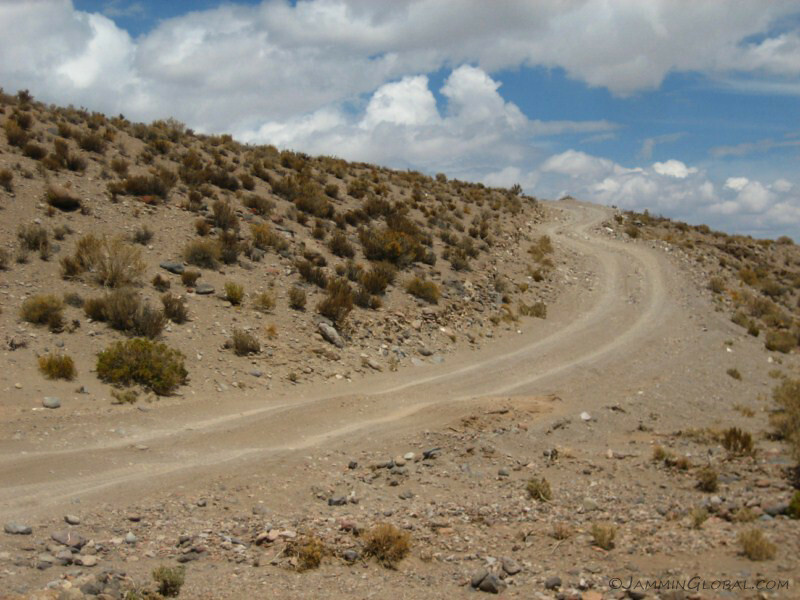 The route joined up with a better-graded highway that was maintained by a Chilean company extracting boric acid nearby. 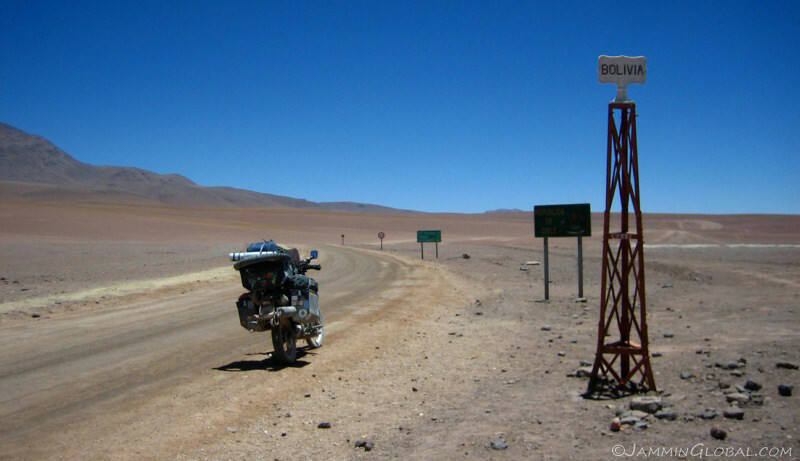 Besides all the fun and games of a nice off-road adventure, there was the business of crossing an international border towards the southern end of the ride. 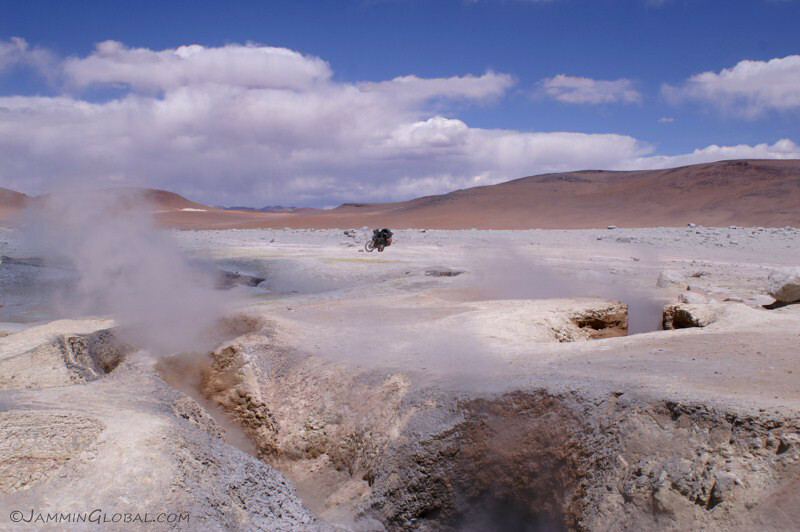 The Bolivian customs office is off the route and requires a small detour near the geysers. 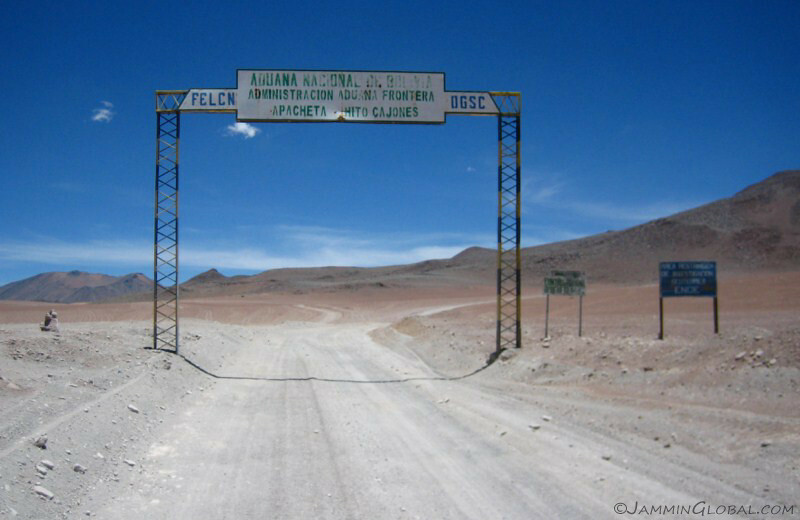 An out-of-place huge metal structure in this desolate land, welcoming you from the Bolivian customs, which was a few kilometers to the right with the route and the geysers straight ahead. 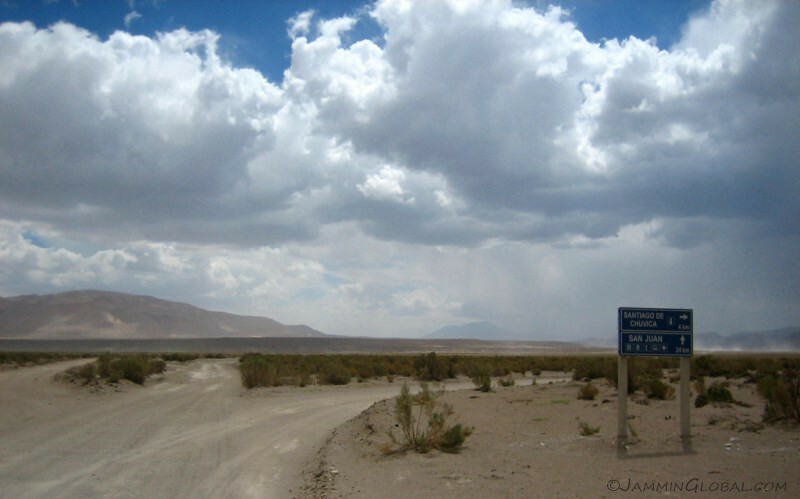 A street sign in the middle of the desert. 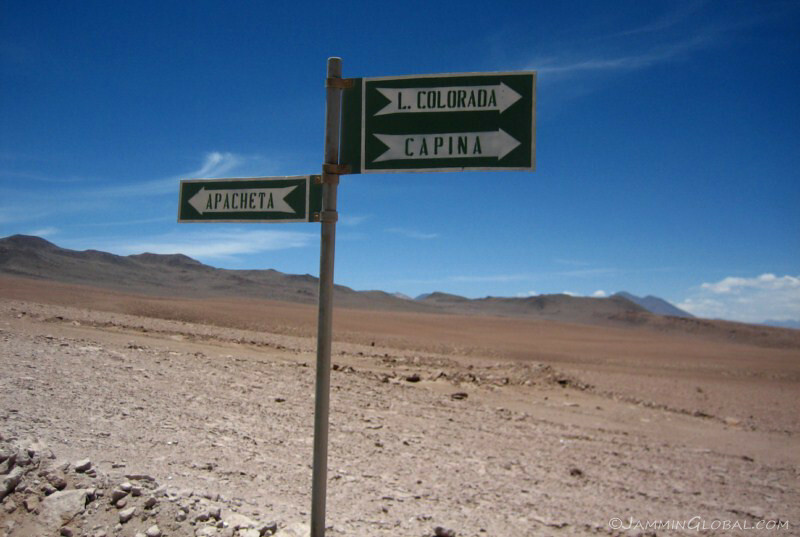 Apacheta is where the customs office is. 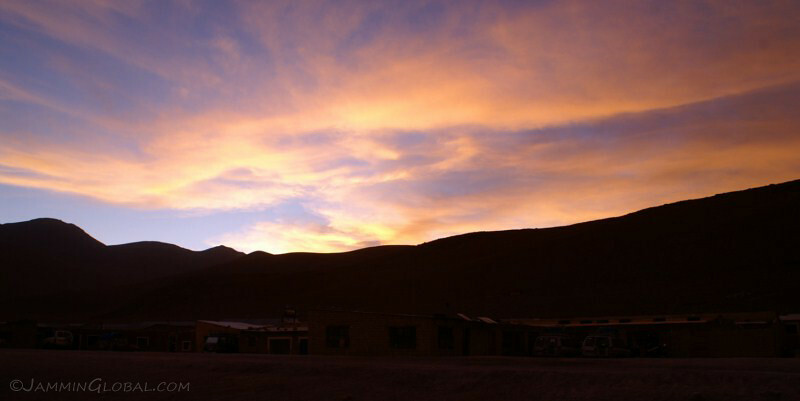 The highest customs office in the world at 5,020 m (16,470 ft). 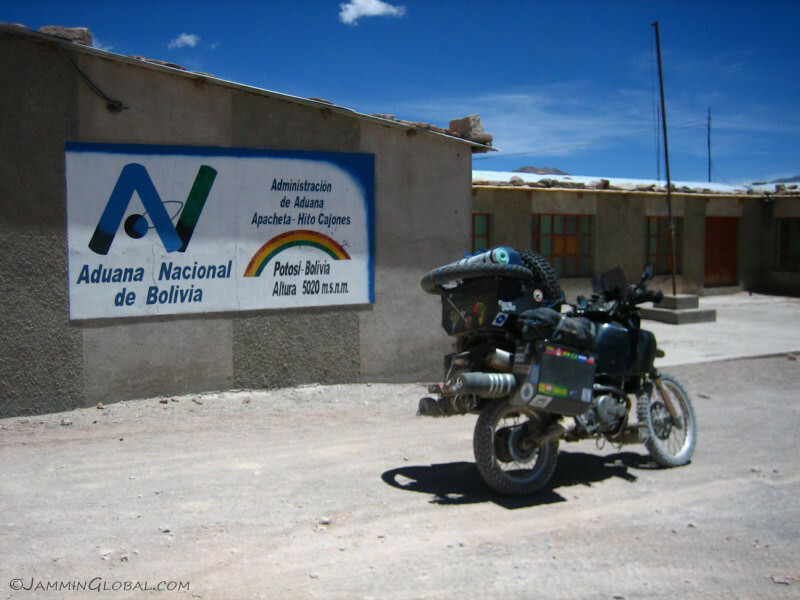 No one was in, but I waited for around twenty minutes in the freezing cold and nothing moved, so I continued without properly checking out the bike from Bolivia. I don’t plan to return for a long, long time, so it’s ok. 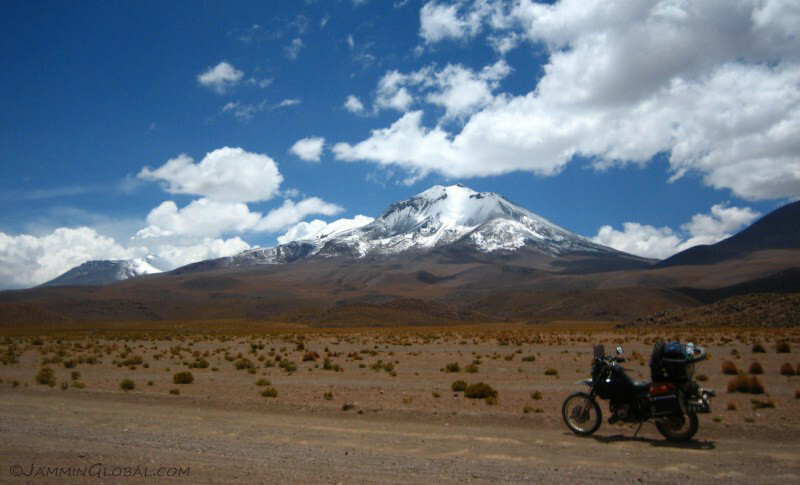 Reaching the highest point of the route near the customs office of 5,049 m (16,566 ft). 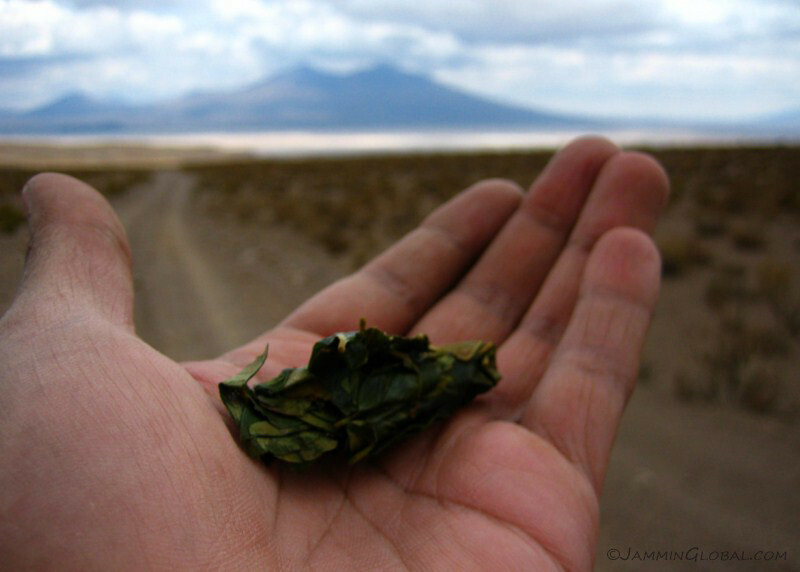 I didn’t get any headaches along the whole route, so either the coca leaves or the altitude sickness pills worked, or maybe both. 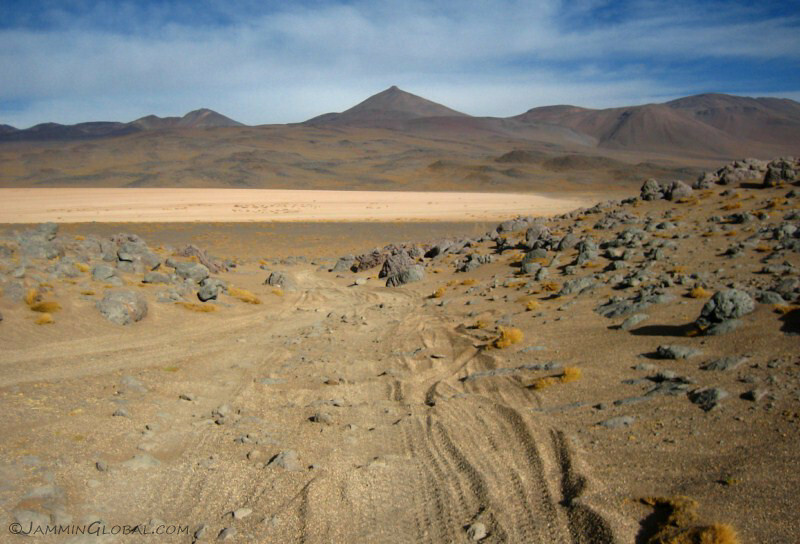 A panorama, coming back from the customs office at Apacheta. 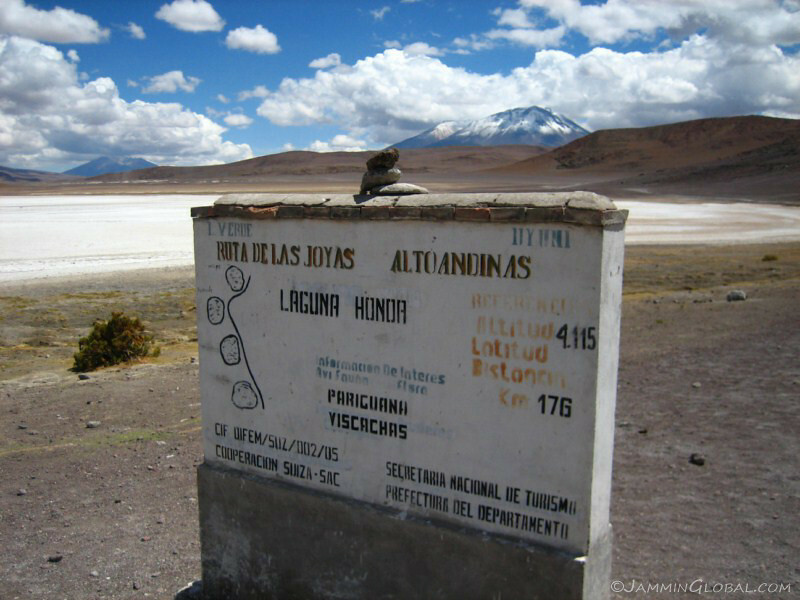 Laguna Colorado is to the left (north) with the geysers to the right. 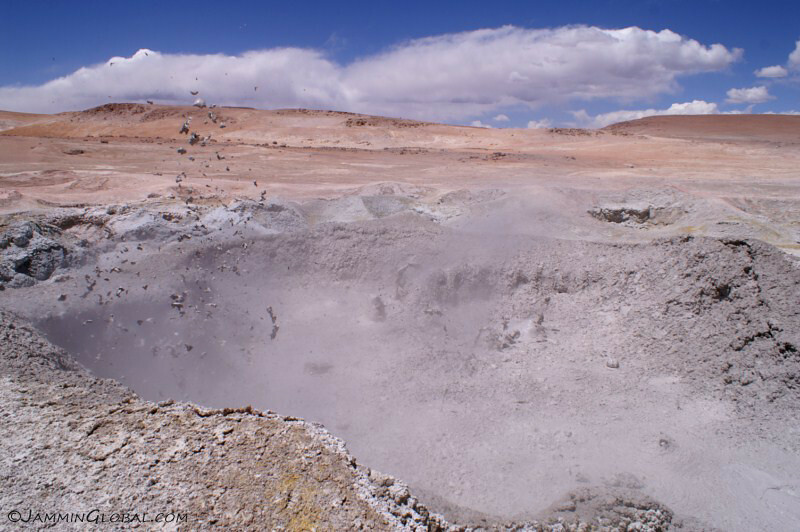 A wide angle view of the discoloration to the rocks from the hot scalding steam and sulphuric acid bursting up from the hot magma under this geologically active place. 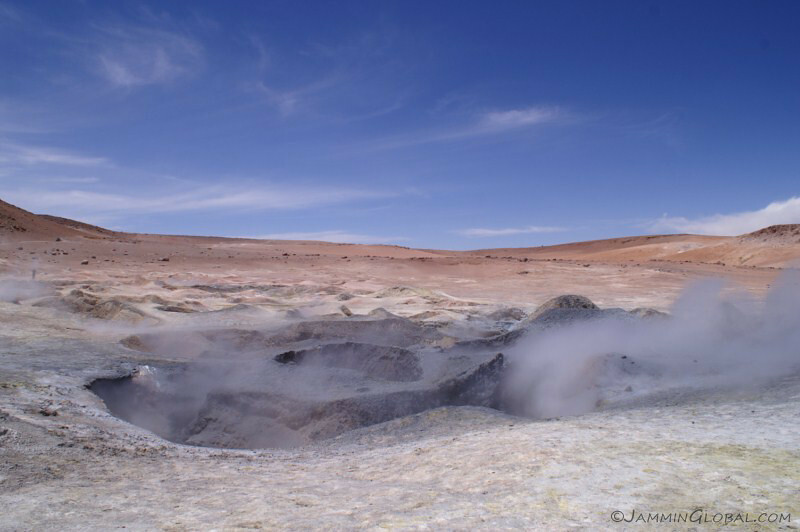 Fumaroles, fountains of hot mud. 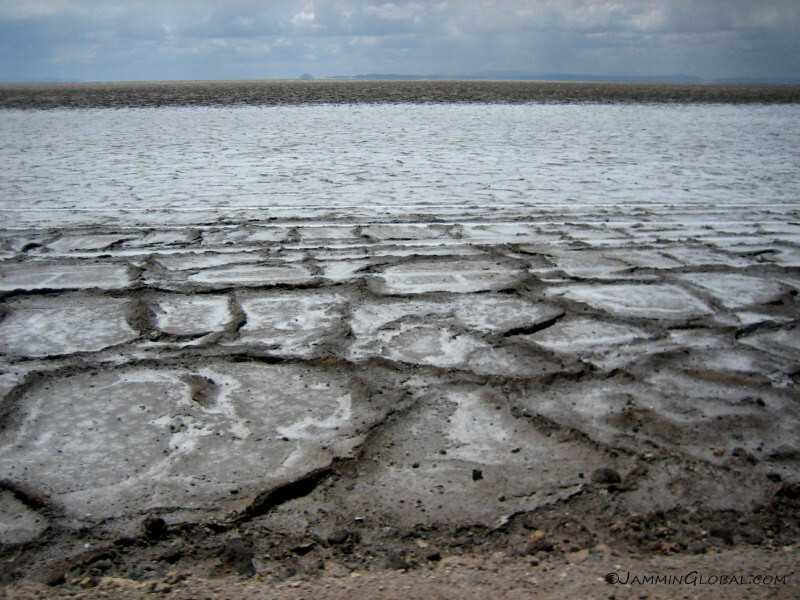 It was entertaining to see the different shapes captured in the mud as the liquefied surface bubbled and burst up. I liked how open this whole area is with no restrictions anywhere, so you can get as close as you like to the steaming cavities. Of course, if something bad happened, you’re on your own. 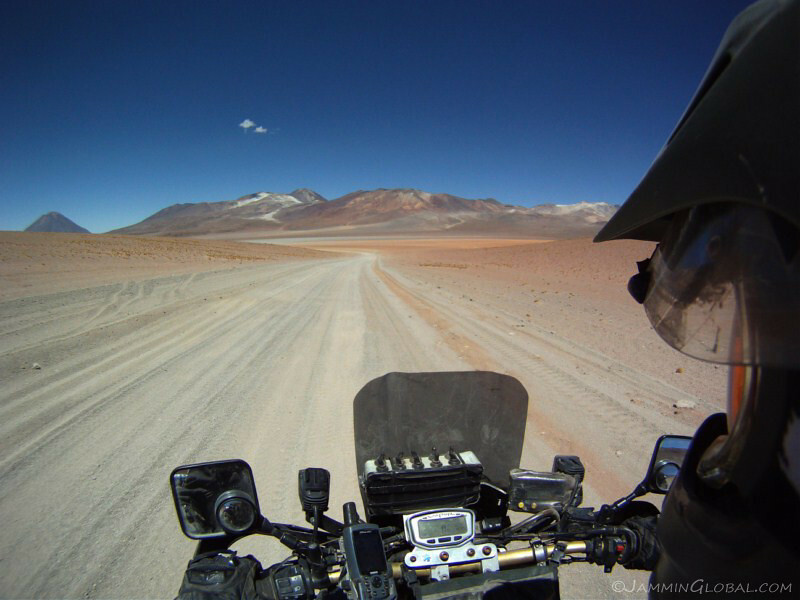 From the geysers, the route was very sandy back to the main piste and I lost momentum on an incline and had to ride the clutch quite heavily to make it over the top and from here on, the clutch would slowly lose its effectiveness. However, I didn’t have to change it out for another 2,000 kms (1,250 mi). 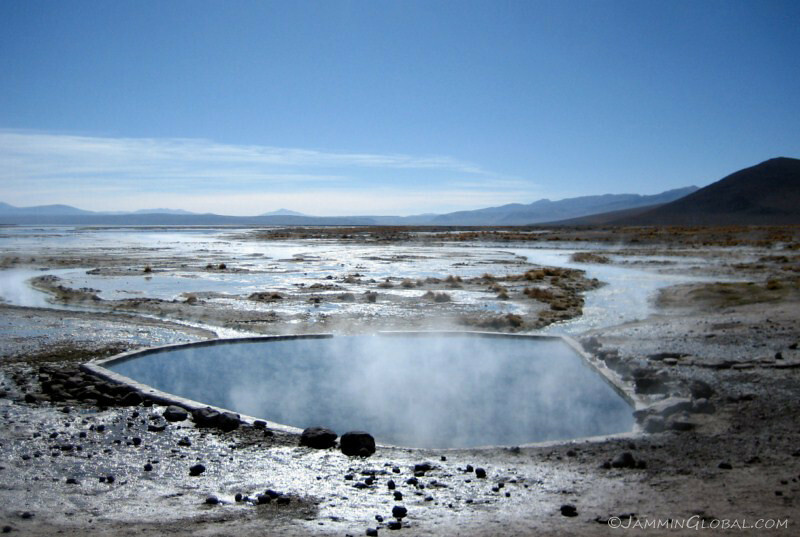 …the hot springs at Salar de Chalviri. 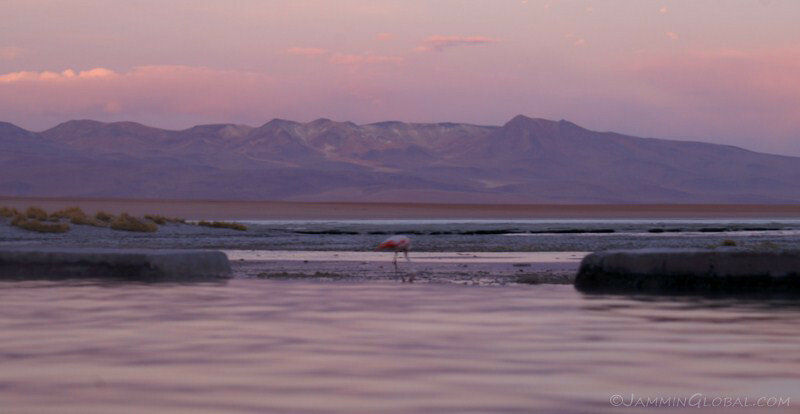 …I soaked my aching body in the comfortably warm waters of these hot springs. 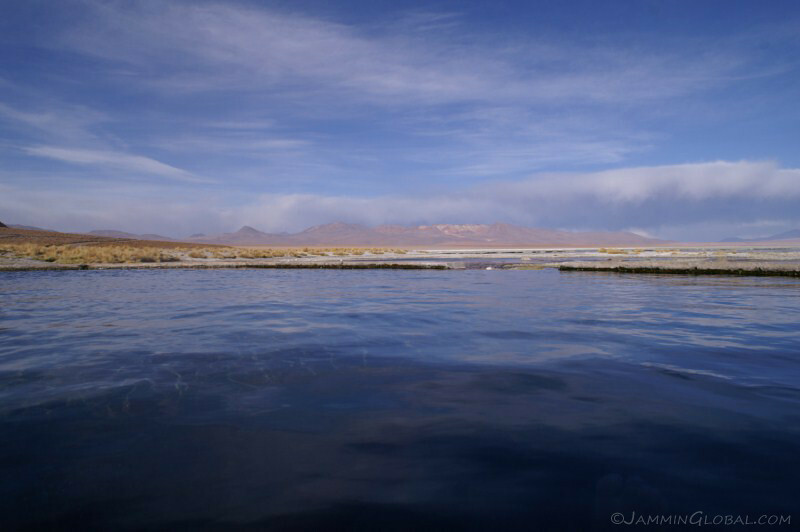 It was quite cold above the water as elevation was at 4,418 m (14,495 ft), but just fine if you stayed submerged. The winds were quite fierce and created waves on the surface. 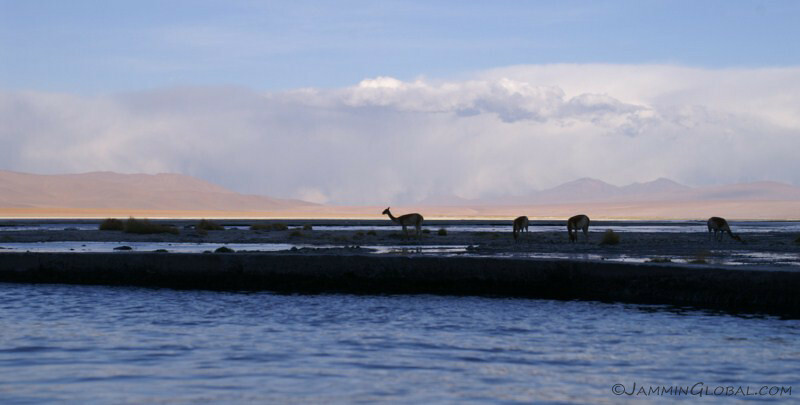 As I lay perfectly still in the waters, these guanacos slowly strode by, only glancing up upon hearing the shutter of the SLR. 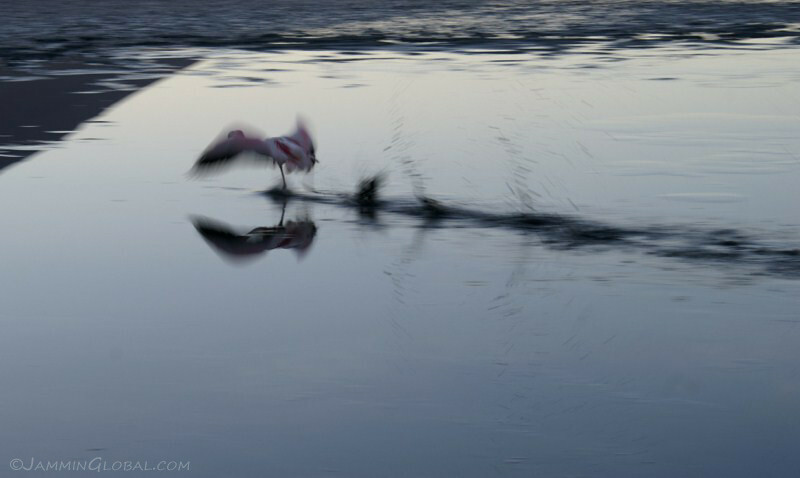 I sat there for about two hours through sunset and observed some flamingoes along with various other wildlife that came by. I know you’re not supposed to stay more than 20 minutes at a stretch in a hot tub, but I kept hydrating and my head was cooled down by the chill winds, so all was good. 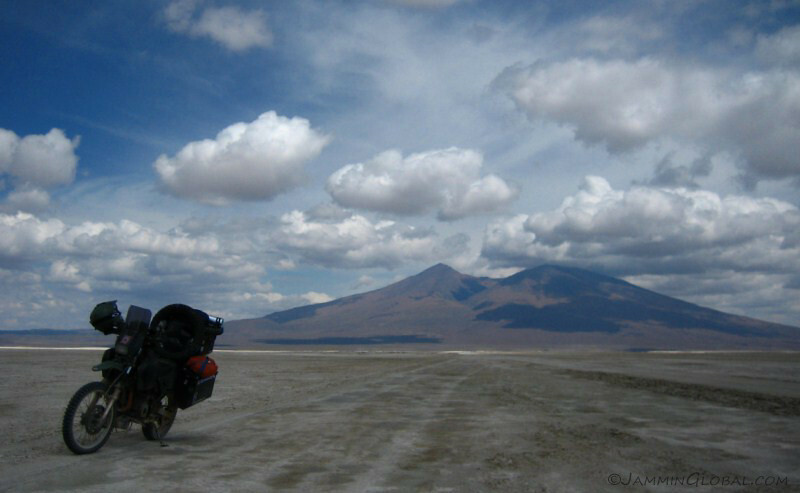 A perfect end to an epic adventure. 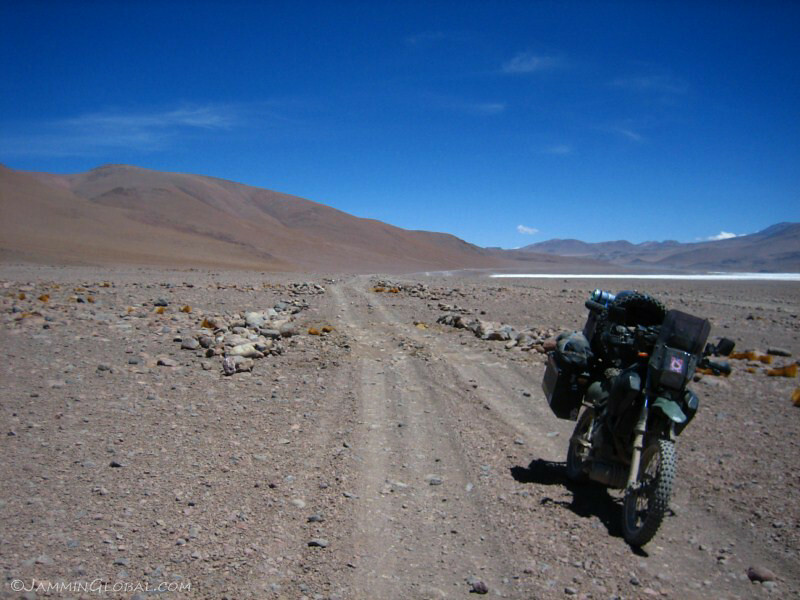 Tomorrow would be the final day on the Lagunas Route and it’s worth all the praise that’s levied on it. 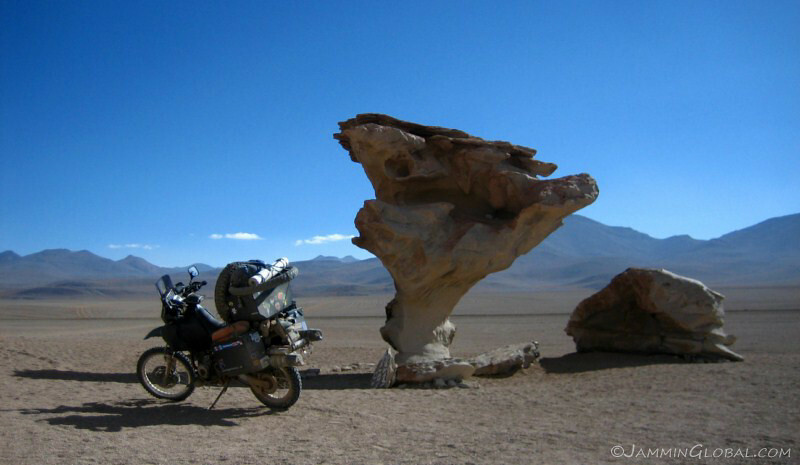 Come here to see all the natural beauty and test yourself by riding your own vehicle. It’s a grueling but rewarding journey. 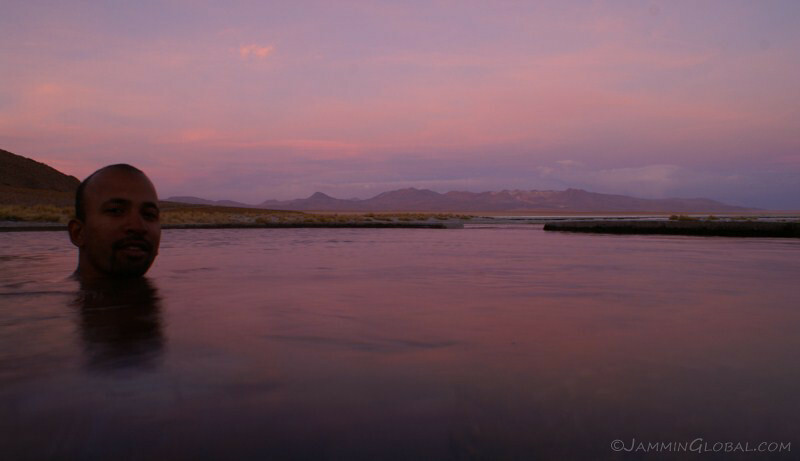 The next morning, hordes of Land Cruisers turned up for a sunrise dip in the hot springs, so I suggest the end of the day for peace and quiet. 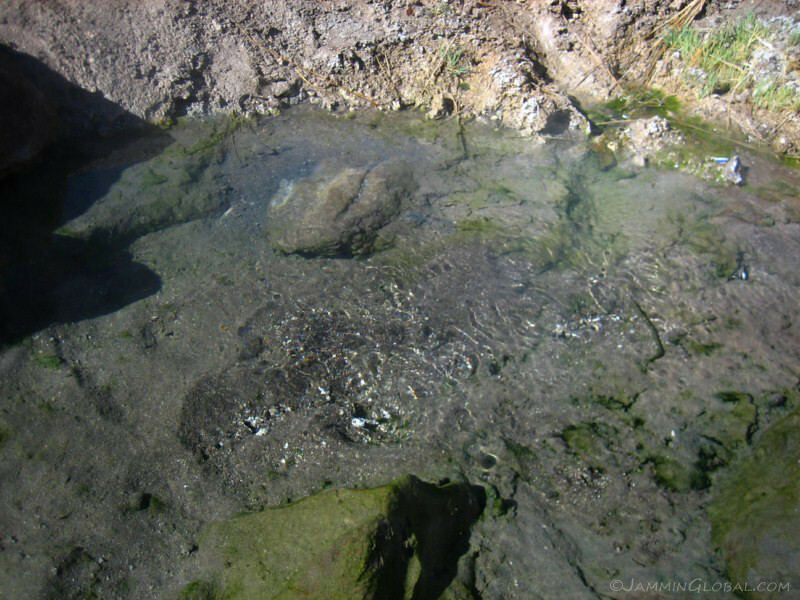 The hot springs are fresh water (which flow into the already salty lagoons) and I filled up my water bottles from a nearby spring. Don’t take water from the hot tub! 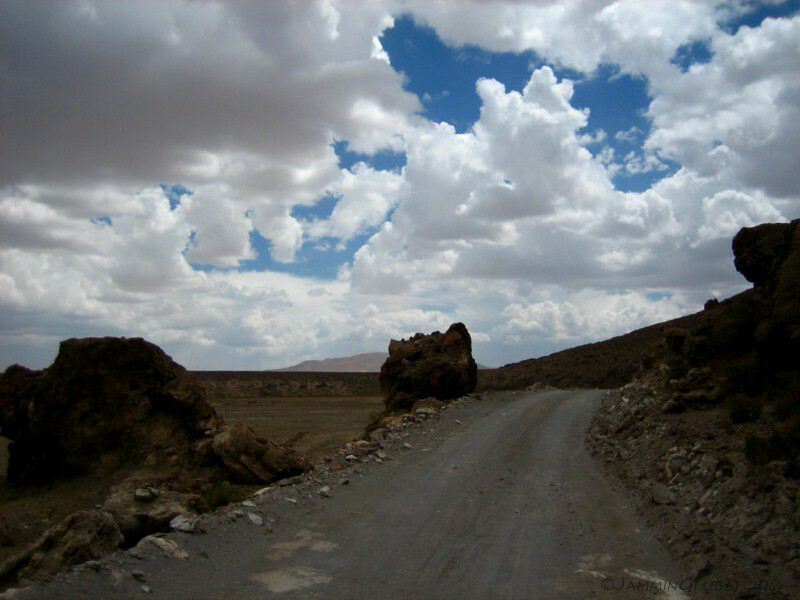 From Polques, the route passes through a valley called the Desierto de Dali and the coloring of the mountains sort of resembles one of his paintings. And I think these rocks in the sand are supposed to resemble his trademark forms, but I was too far away to see. 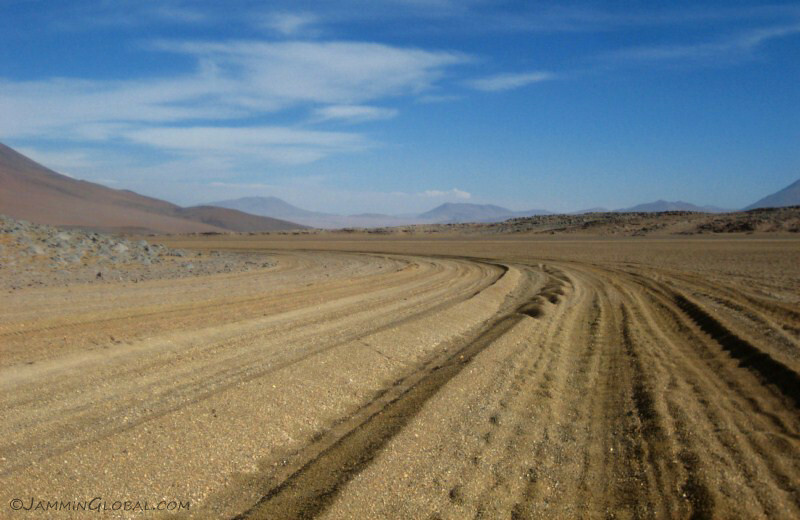 The route was still sandy and corrugated but much better maintained than further north. 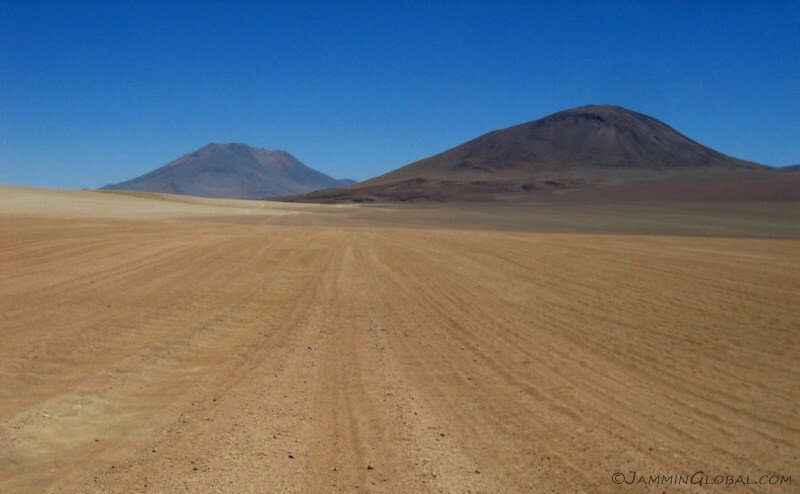 It’s sandy, but over a hard surface that was recently graded. 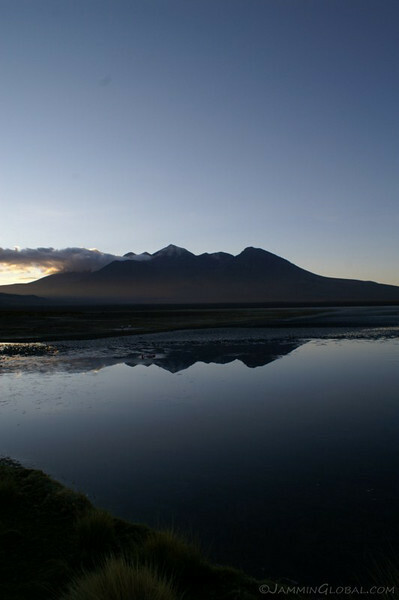 A panorama capturing the landscape dotted with volcanoes and mountains. 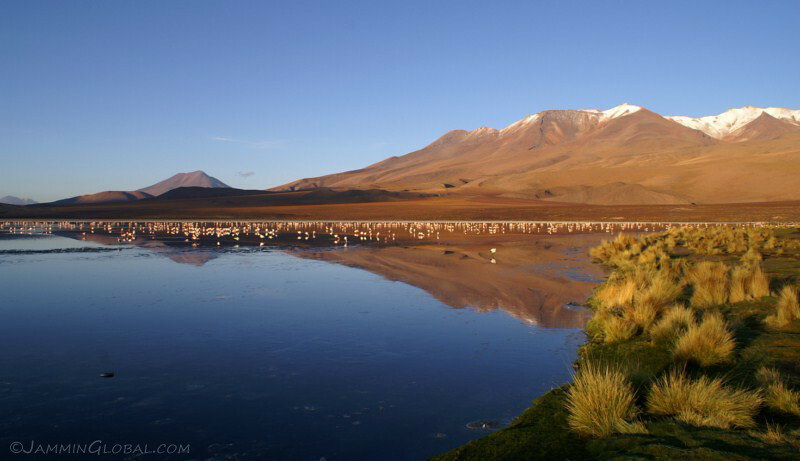 And finally, the last jewel in this desert, Laguna Verde (green lagoon). 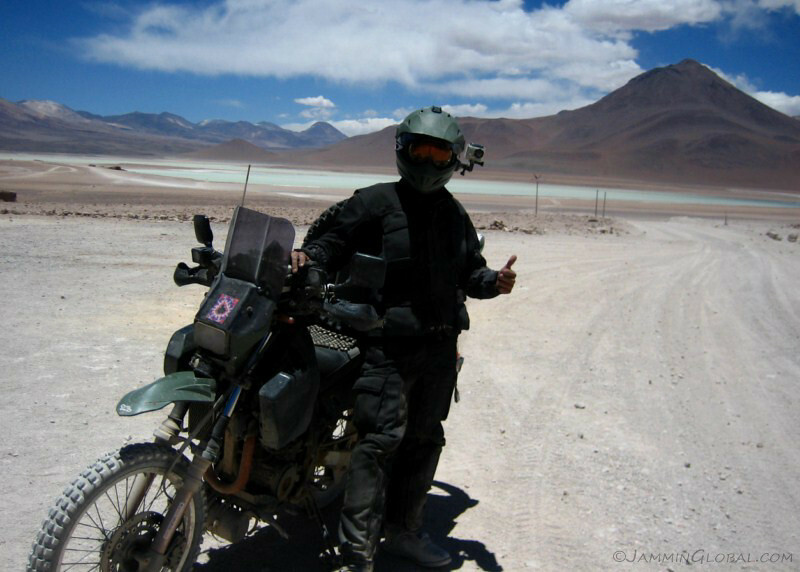 The guard at the southern gate offered to take my picture as must be customary for overlanders successfully making it across the Ruta de la Joyas Alto Andinas. 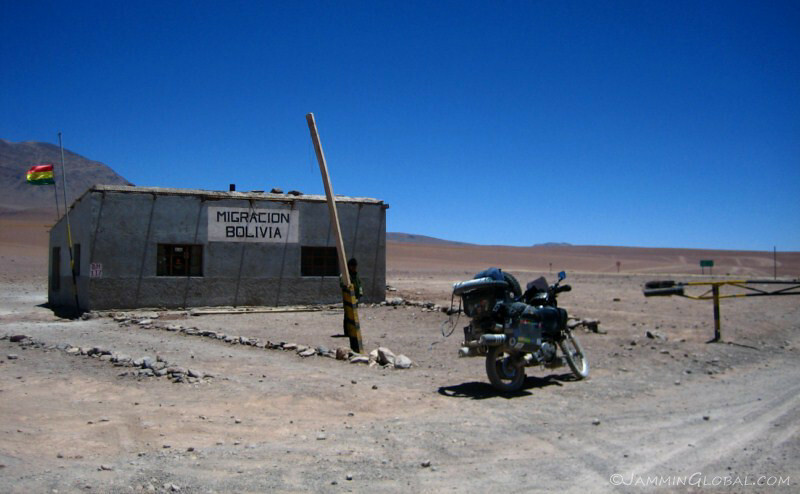 From there, it was a short climb up to the Bolivian immigration post at the border, which was quite high at 4,500 m (14,765 ft). 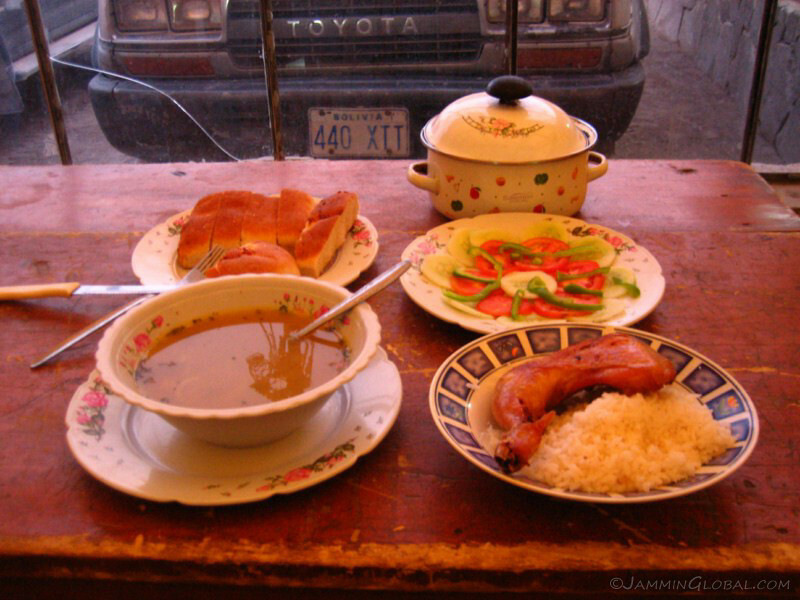 I didn’t tell them about the customs office being closed yesterday, because they probably would have made me go back. I think they’re going to open a new customs office near Laguna Verde. 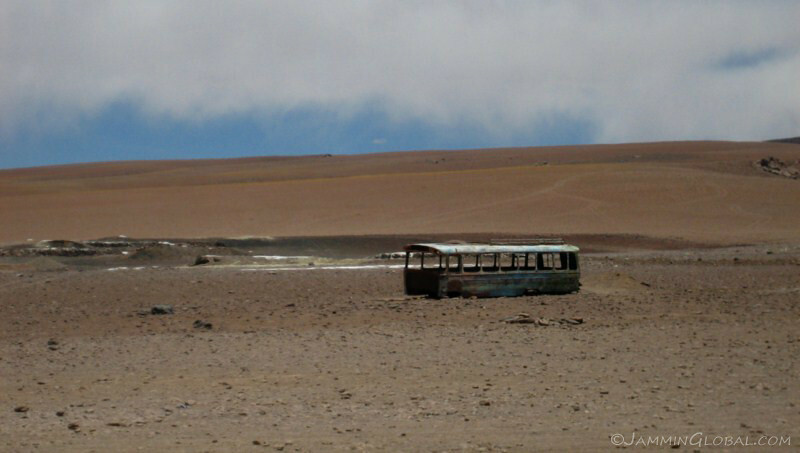 A school bus that didn’t make it. 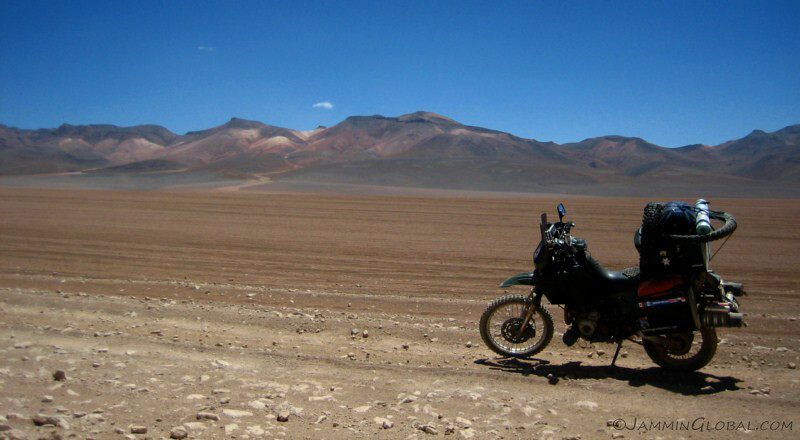 Finishing off a strange and wonderful journey through this kaleidoscope of experiences that are waiting for anyone willing to swim in the sand of southwestern Bolivia. It’s all the way down from up here. 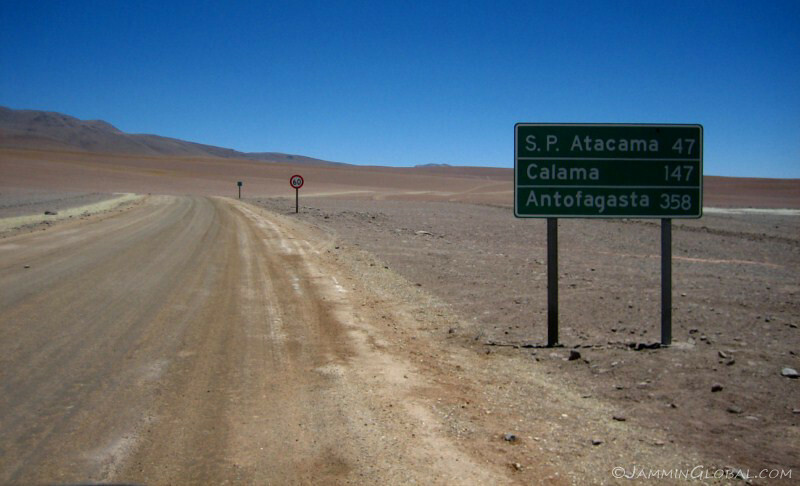 The paved road is coming from Paso de Jama, but if you enter Chile from Bolivia, you are required to head down to San Pedro to visit Chilean customs and immigration. 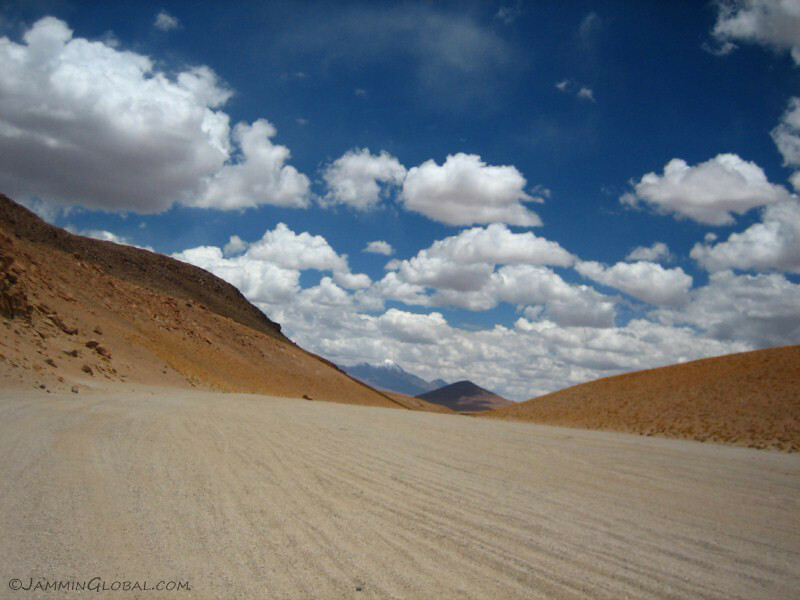 I don’t know if you’re allowed to head straight to Argentina. 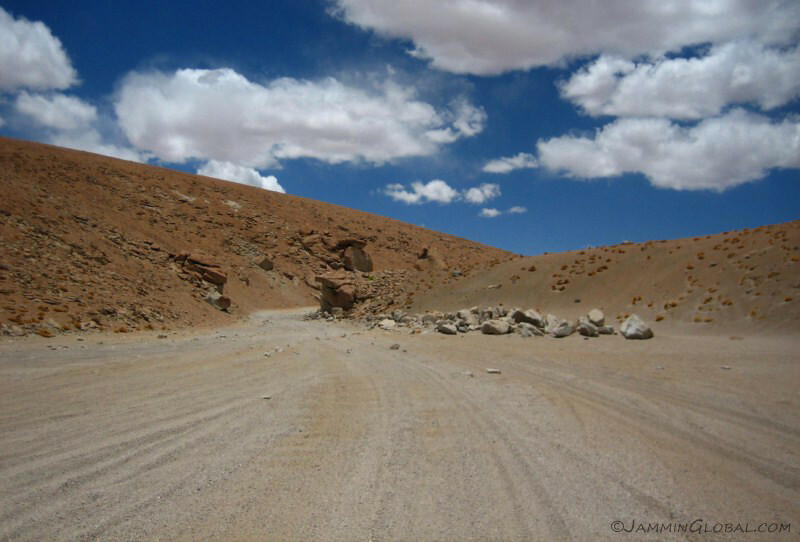 The road drops down constantly into the valley below where the Salar de Atacama is. 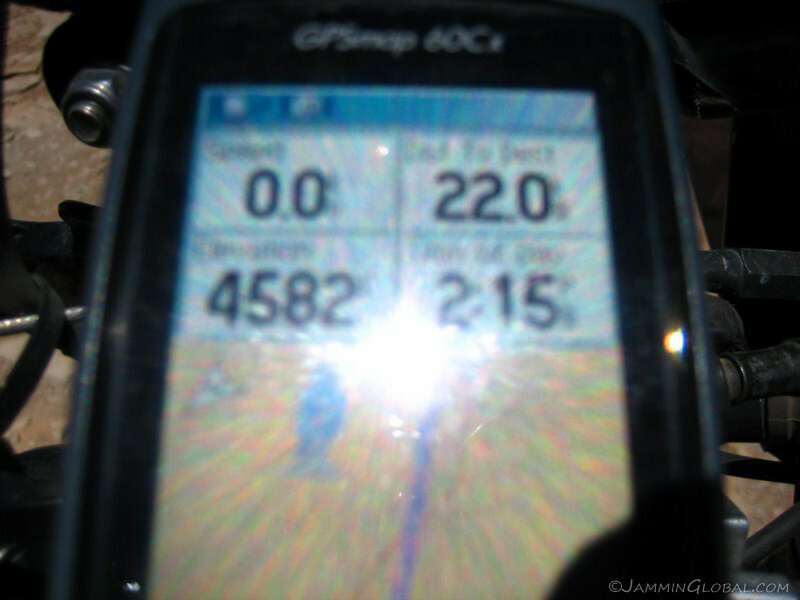 You drop 2,100 m (6,890 ft) in 50 kms (31 mi) down to 2,500 m (8,200 ft). 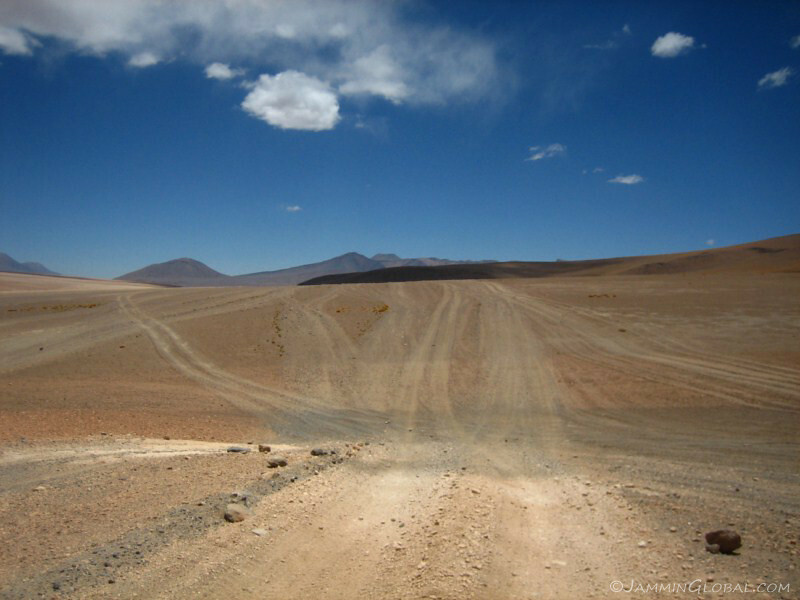 One of the Land Cruiser drivers told me he likes to turn off the engine and just coast all the way down. 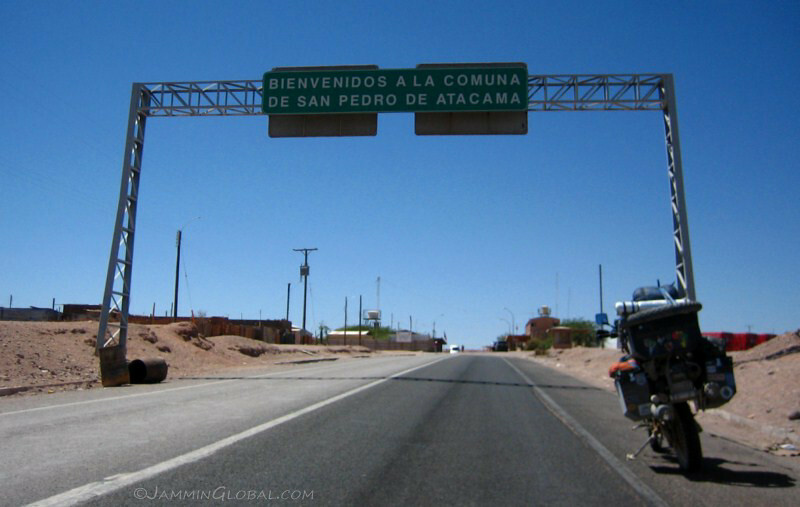 Arriving at San Pedro de Atacama and that concludes the journey across the Lagunas Route. 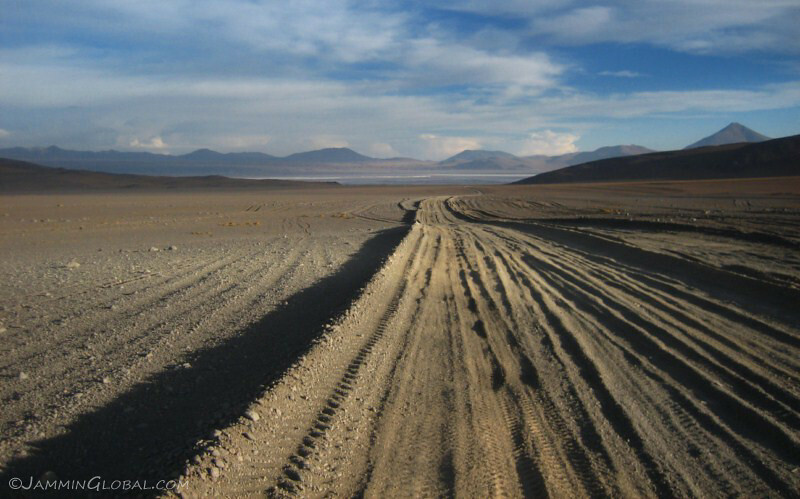 With the tourist attraction of the salar done with, it was time to get down to business and begin the infamous Lagunas Route (or Ruta de las Joyas Alto Andinas) through remote southwestern Bolivia across a lone, sandy, rutted track heading to San Pedro de Atacama in Chile. I was dreaming and dreading of this route for the longest time. 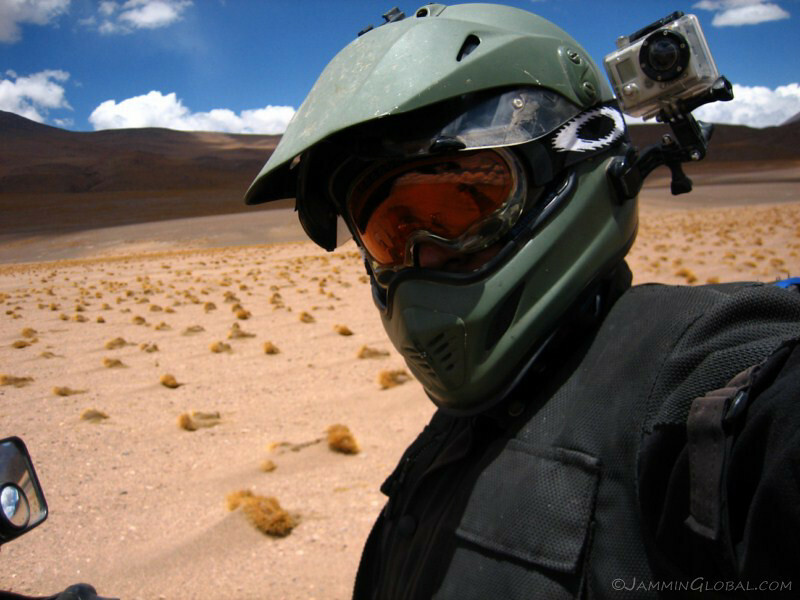 It was challenging to the best of off-road riders and I knew my skill level wasn’t up to par, yet I was throwing myself in on the belief that I could make it through. 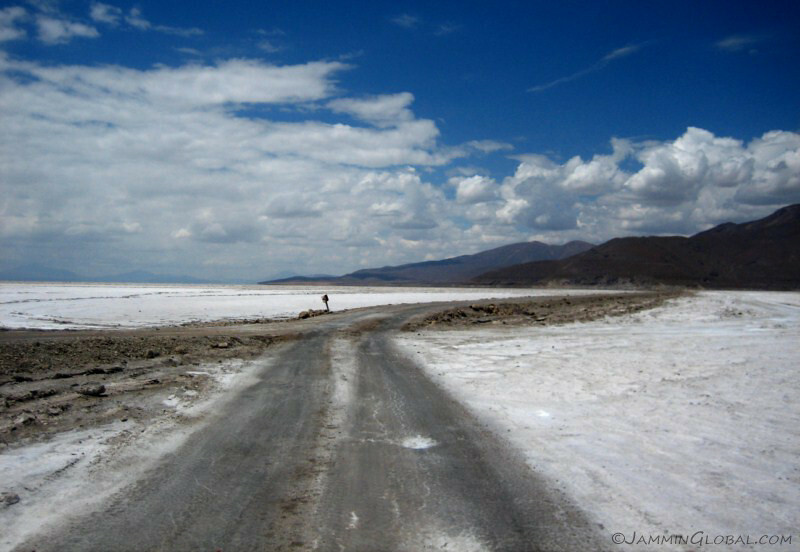 The tracks in the southern end of the Salar de Uyuni all funnel down to this exit that joins the route heading to the town of San Juan. 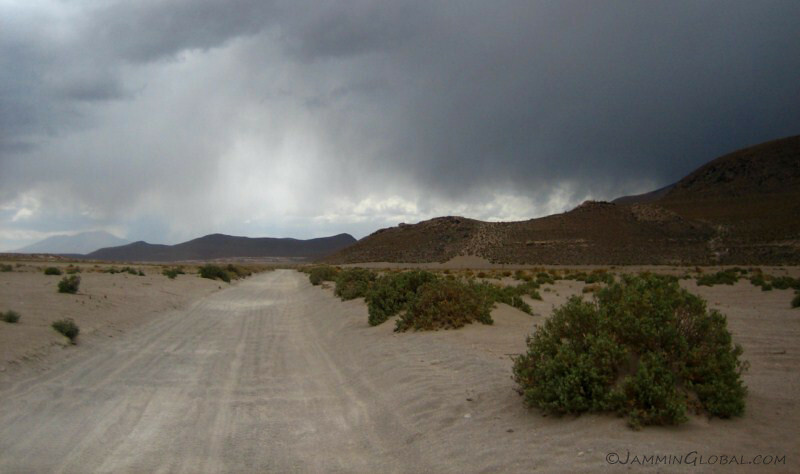 The rainy season around Uyuni had started and I was lucky to come here during a short dry spell. There is a lot of mud around the edges and previous riders have gotten stuck. 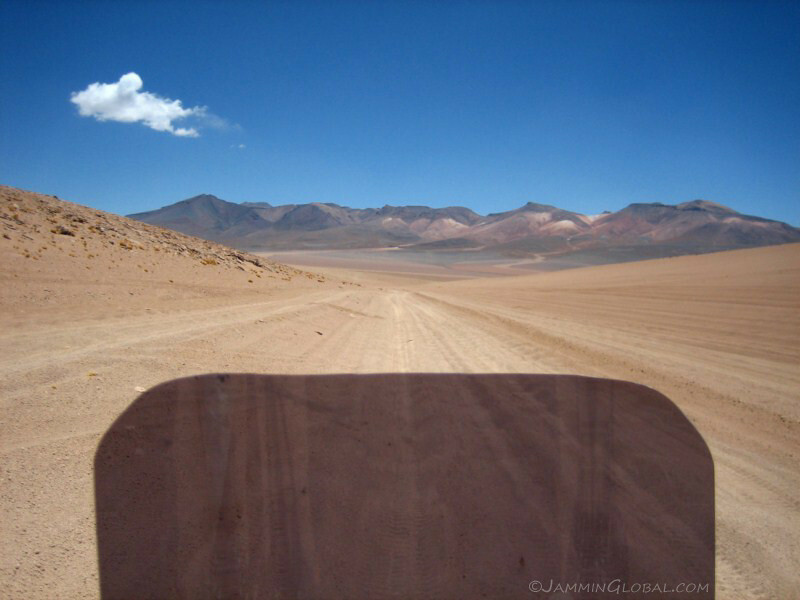 The heavy washboard (corrugations) started right away and I turned off the complaining department and just told myself to enjoy whatever comes in the next 500 kms (310 mi) to San Pedro de Atacama. 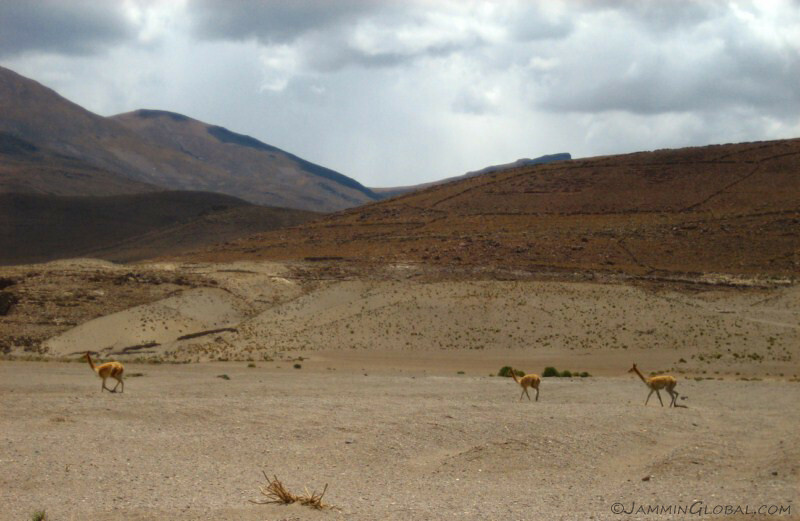 It was reassuring to see these sturdy guanacos in this high-altitude desert. 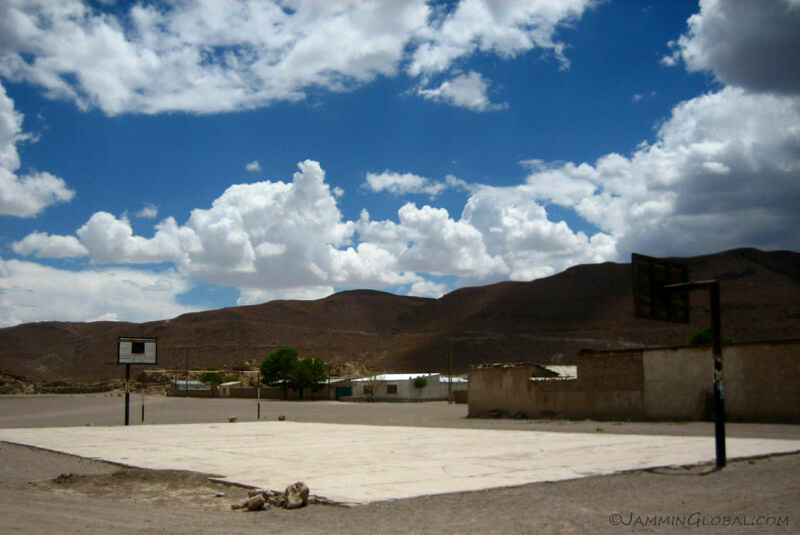 Just to add to the strangeness of the experience, I passed by a a basketball court as the route went through a small village. 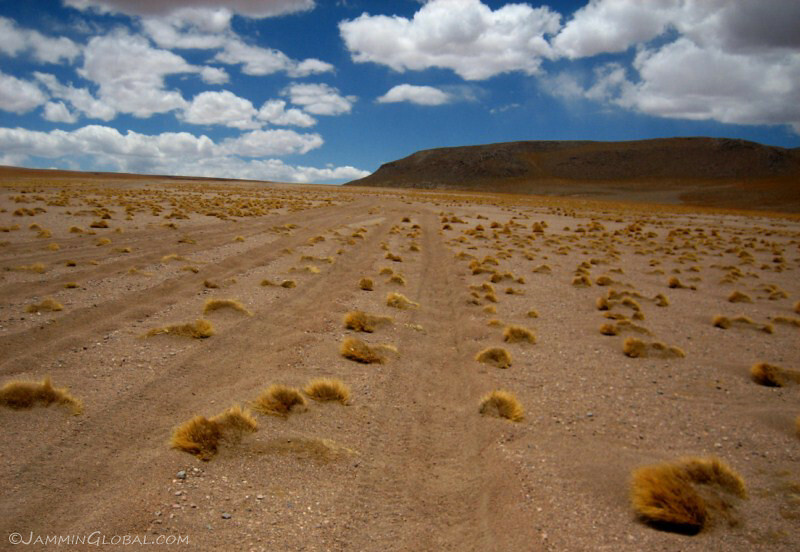 I also saw a number of them on the Tupiza to Uyuni stretch and remember seeing a USAID and EU donor organization signs. 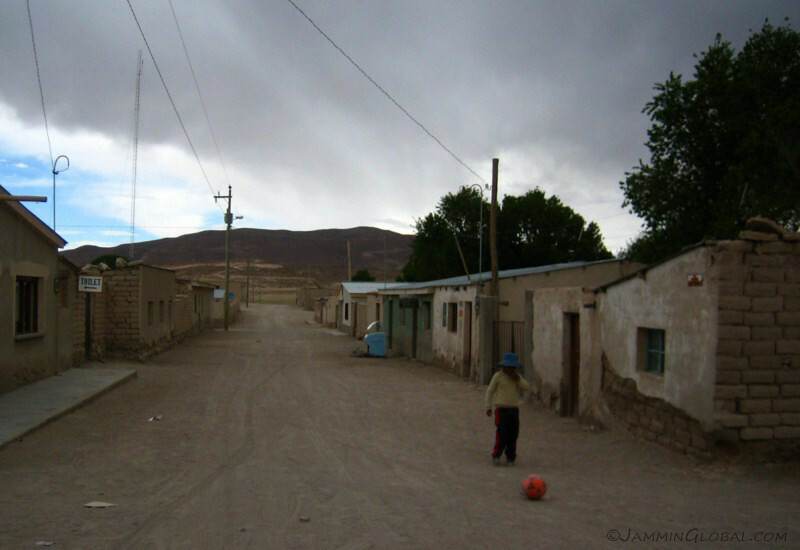 External aid felt basketball courts would be considered development. 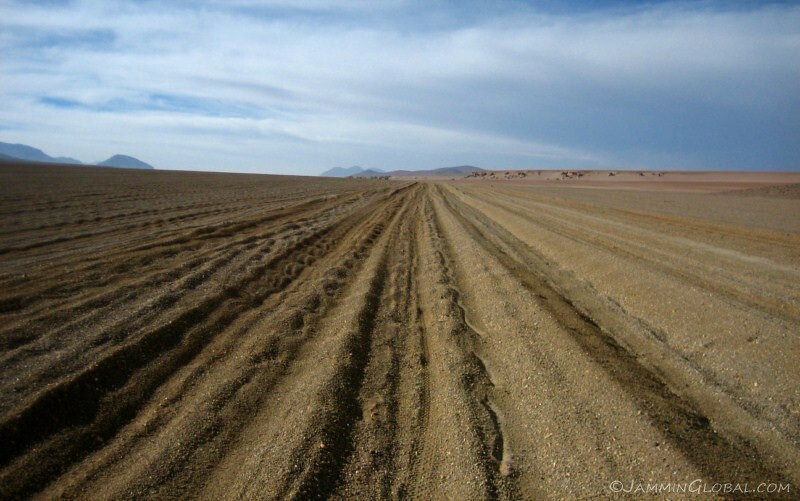 Back on the track, which got better in places, but the corrugation was ever present and that too, the surface was covered in loose sand. A storm was brewing towards the east and I hoped Yoshi, on his bicycle, wouldn’t be affected. 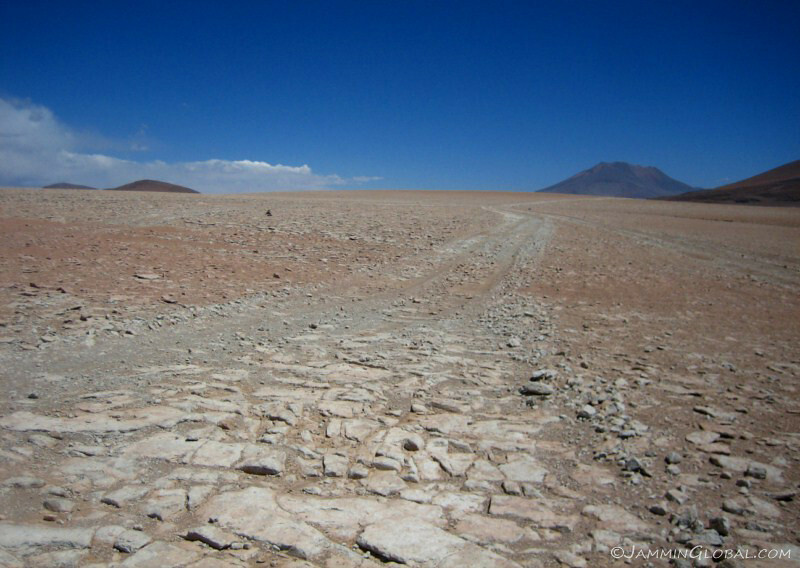 The route followed what seemed like a coastline, but the bed of perhaps the crust of the dried lake was at the same level now. 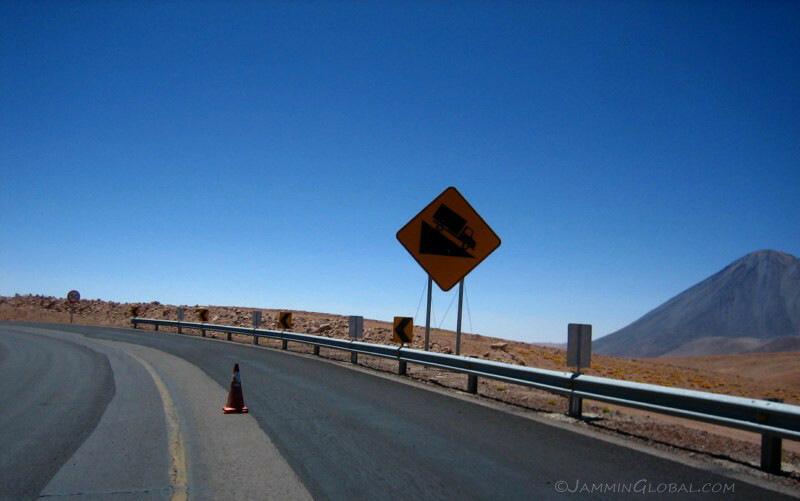 I had GPS waypoints, but no auto-routing (sacrebleu), so it was reassuring to see a sign for San Juan as the GPS was only capable of drawing a straight vector between my current position and the destination. 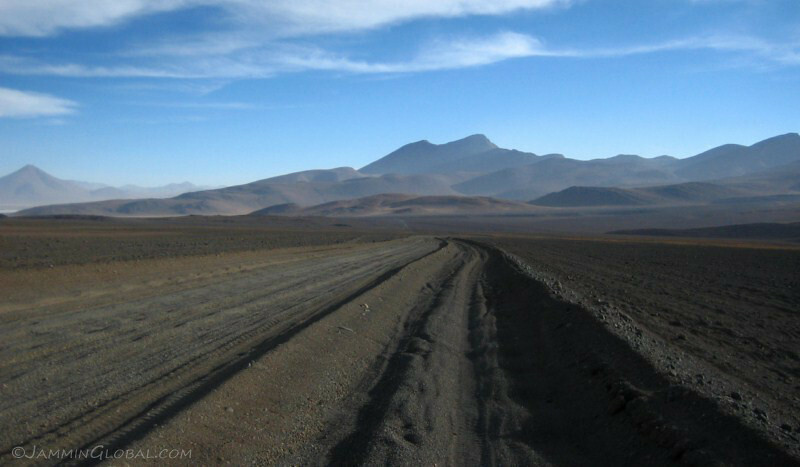 The route went through some deep sand just before getting to San Juan and my energy was sapped after bouncing in and out of deep corrugations and plowing through the sand. 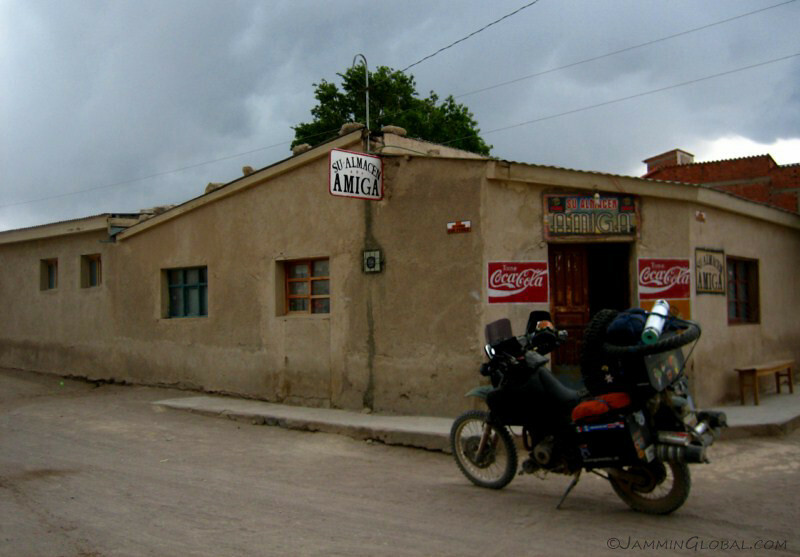 …the last reliable petrol stop until San Pedro de Atacama. 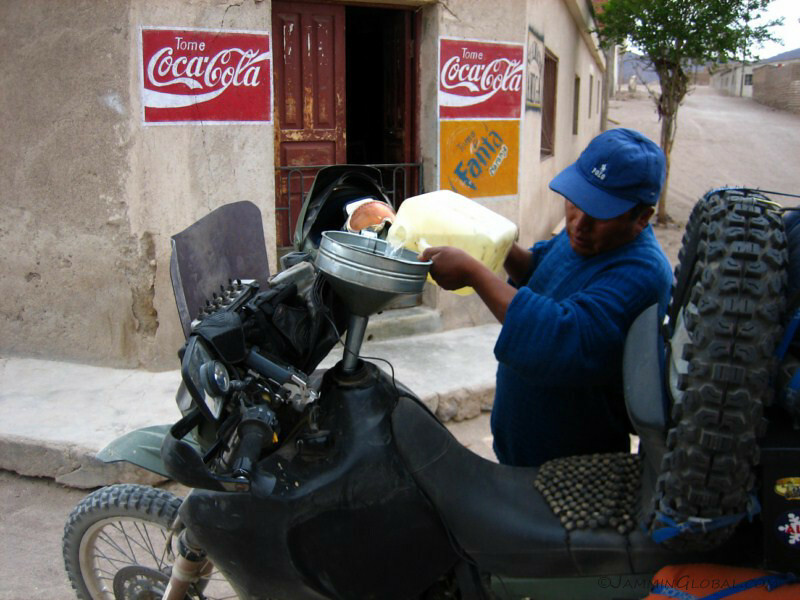 The Su Almacen Amiga (your friendly store) has basic supplies and petrol at B6/liter (US$3.32/gal), which is 60% over the nationally fixed price, but still way cheaper than petrol in Chile. 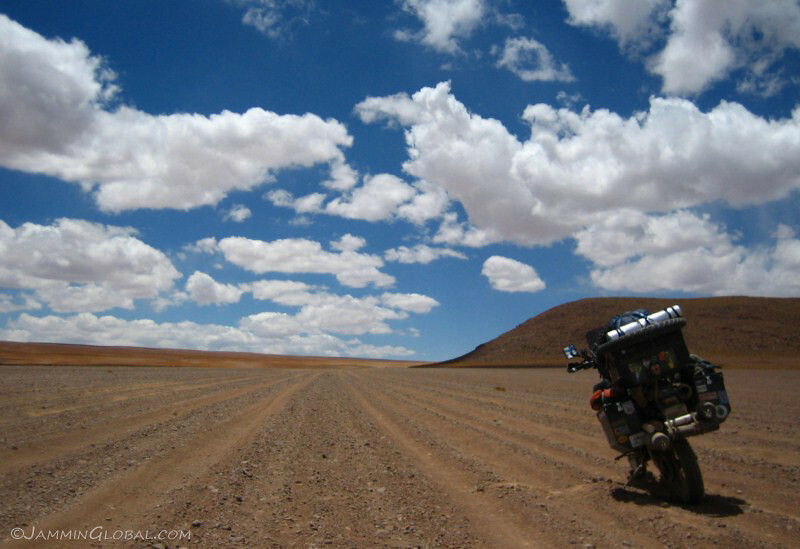 I topped up the 40 liter (10.7 gal) tank and along with enough petrol, I was carrying about 7 liters of water and enough food for about 5 dinners with oatmeal for breakfasts and the nuts and dried fruits for lunch. 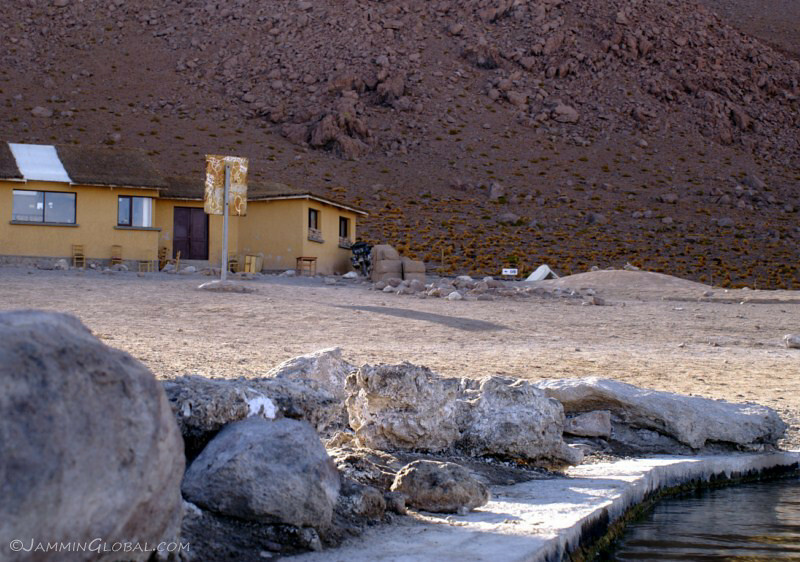 I was too beat to camp and the only open lodging was this salt hotel for B30/night. 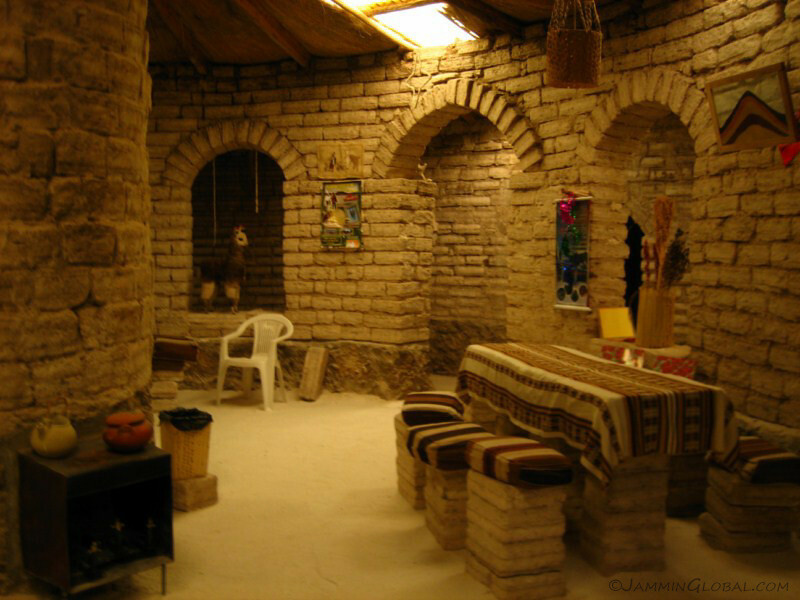 It was circular with rooms on the perimeter and the sandy floor made for a hushed atmosphere. 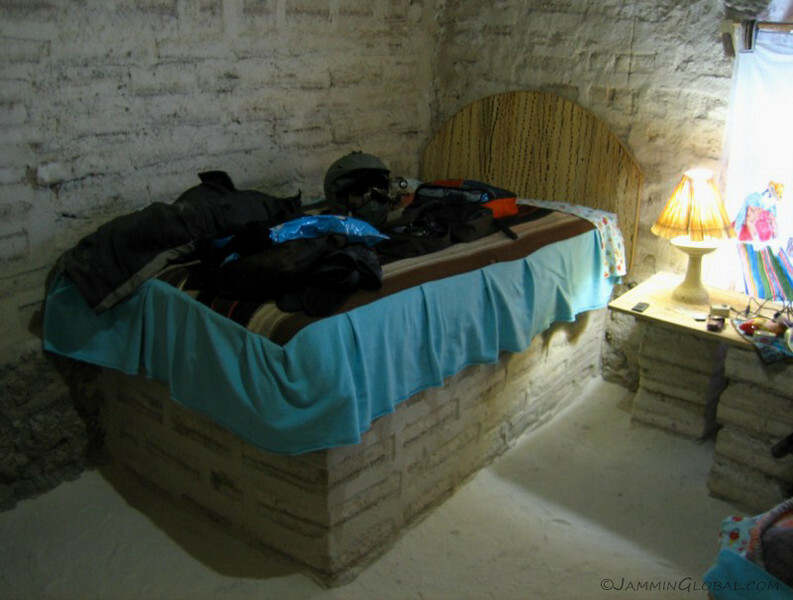 The beds and all furniture were constructed from blocks of salt and I was impressed with the place. It felt luxurious compared to the places I had stayed at the previous few nights. 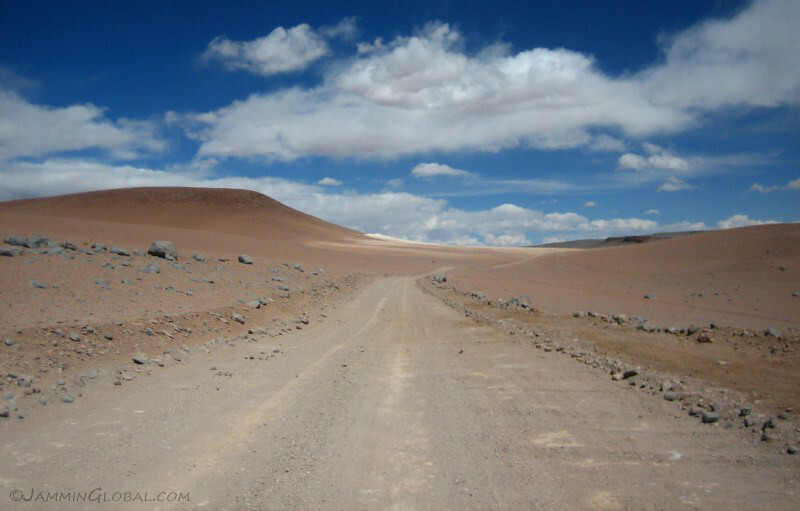 Hotels along the route are mainly setup to provide lodging for the Land Cruiser tour groups, so food isn’t provided, which was fine since I was carrying my own food. 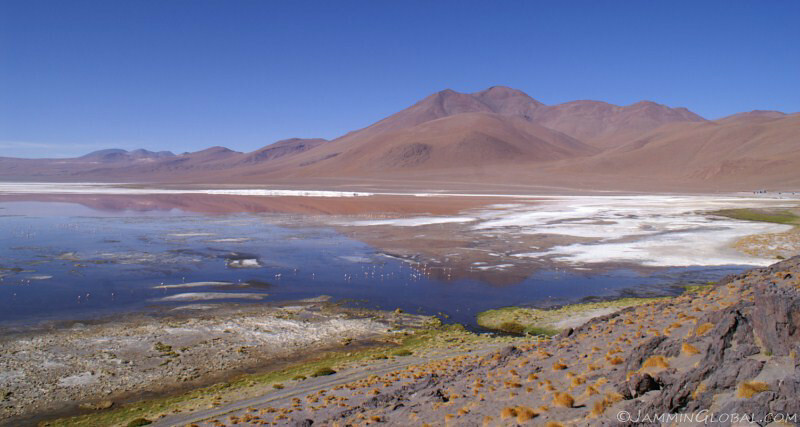 Highlighting the scarcity of water here, a cold shower cost another B8. Heading out the next morning towards Ollague and I think this is the track. 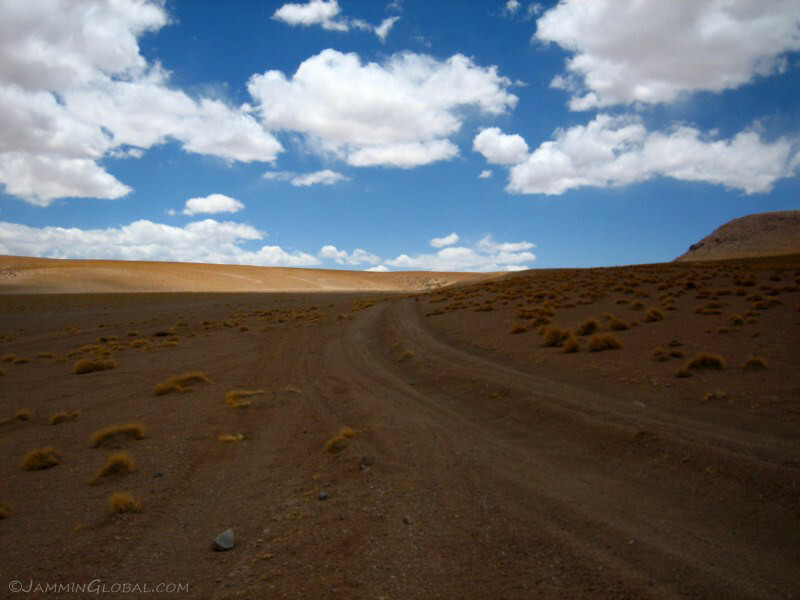 It doesn’t really matter here, as you basically head towards a general direction on whatever path you want. 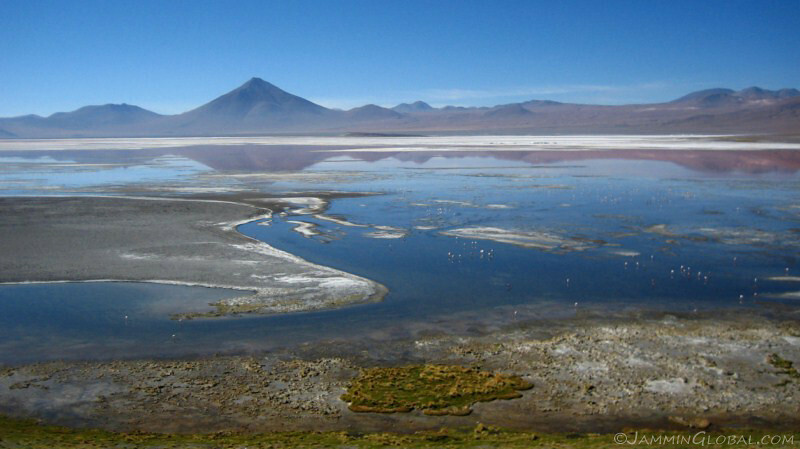 I figured the Salar de Chiguana was on the other side of this mound. 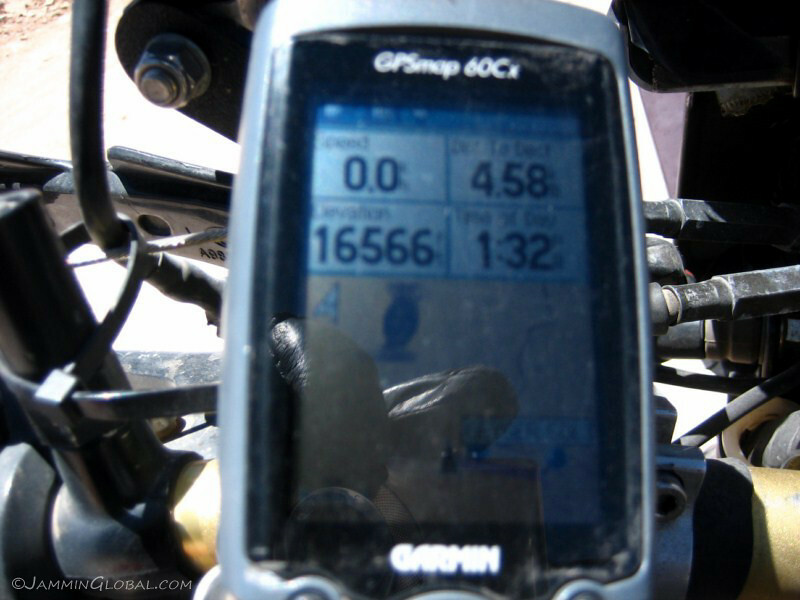 Tonny Strulovic catching up to me on his KTM640 Adventure. 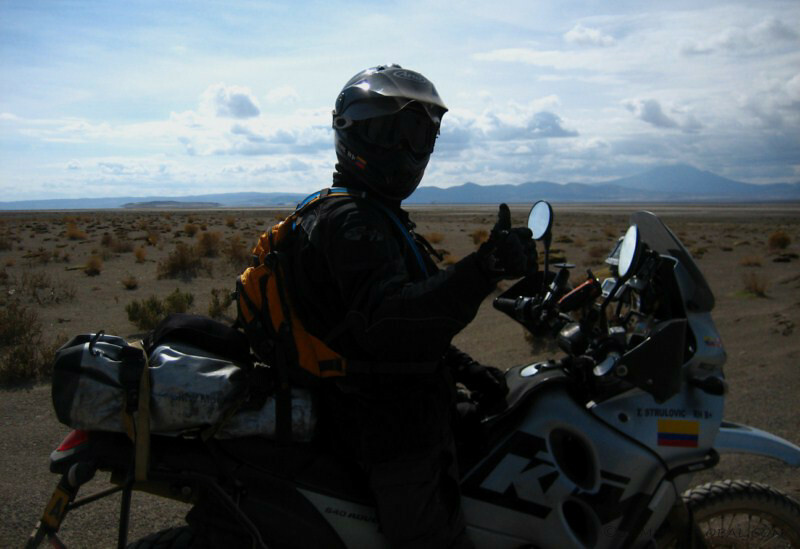 He’s on a two-month whirlwind trip from Bogota down to Ushuaia and back. 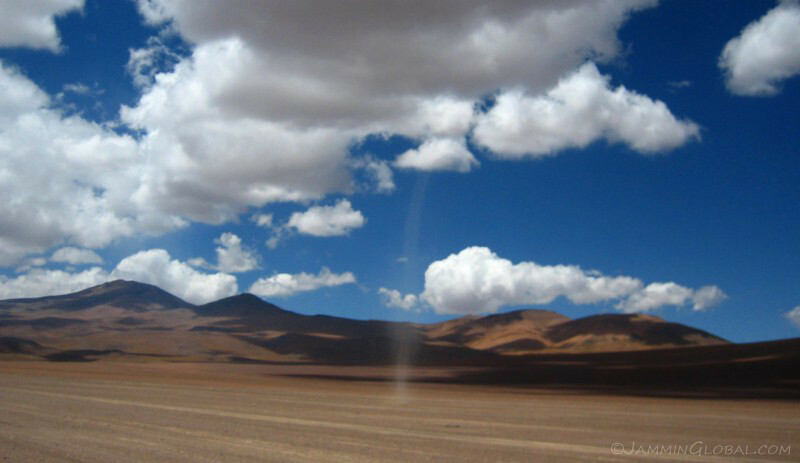 I was put in touch with him through Reginaldo (from Curitiba) and met up with him in Uyuni. 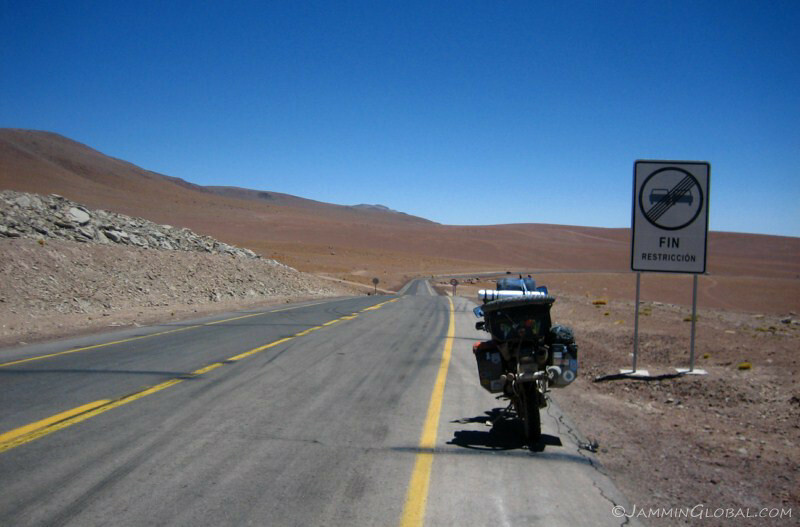 He had already decided to do this route with one of the tour groups, where the Land Cruisers carry your panniers and luggage and provide petrol, food and lodging for about US$120, which is not a bad deal, considering the route. 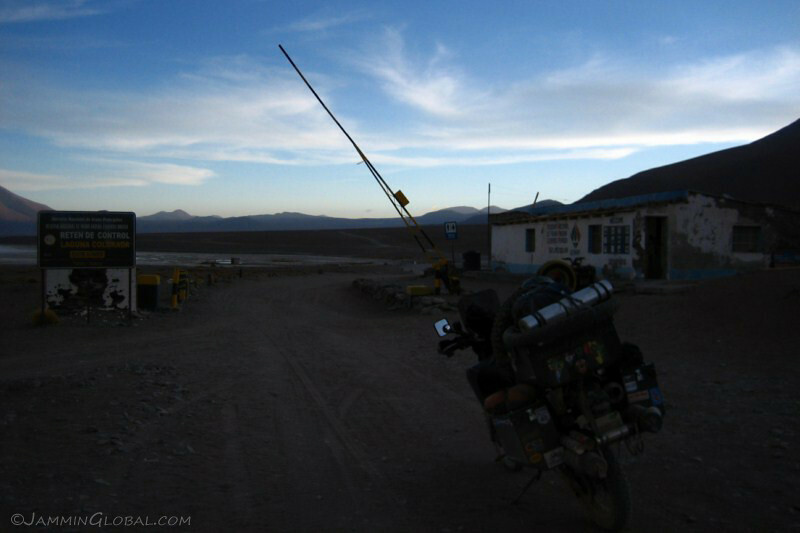 However, you have to be on a strict schedule as the tour groups do the route in three days, getting up at 4 am some days and I wanted to take it more easy and have the choice of where to camp each night. 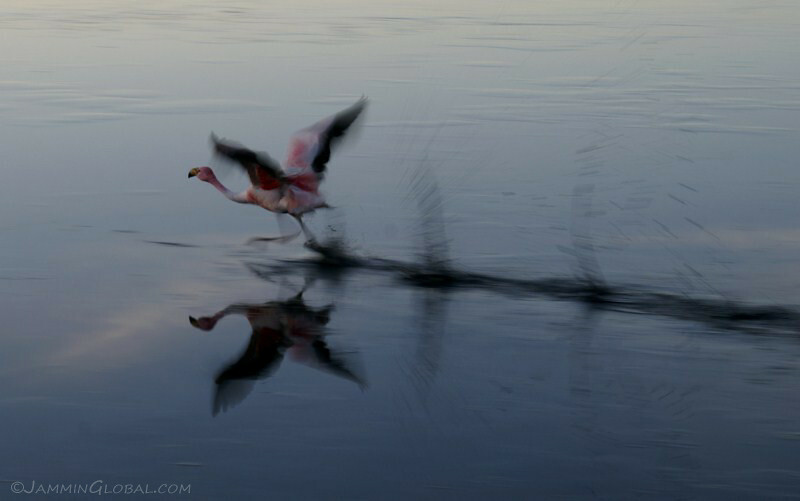 Tonny took off into the distance and I would catch up with him in San Pedro. 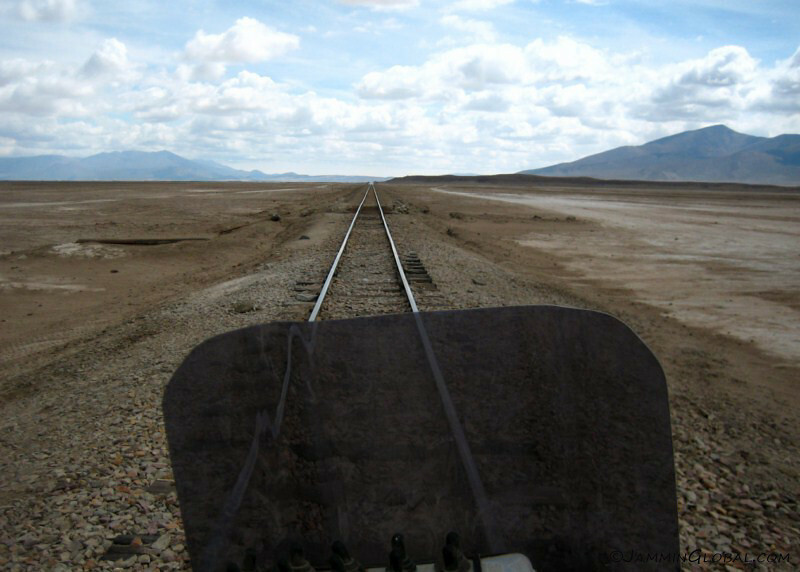 A train from Uyuni heading to Ollague, on the border with Chile, across the Salar de Chiguana, under the shadow of Volcan Coyumichi. 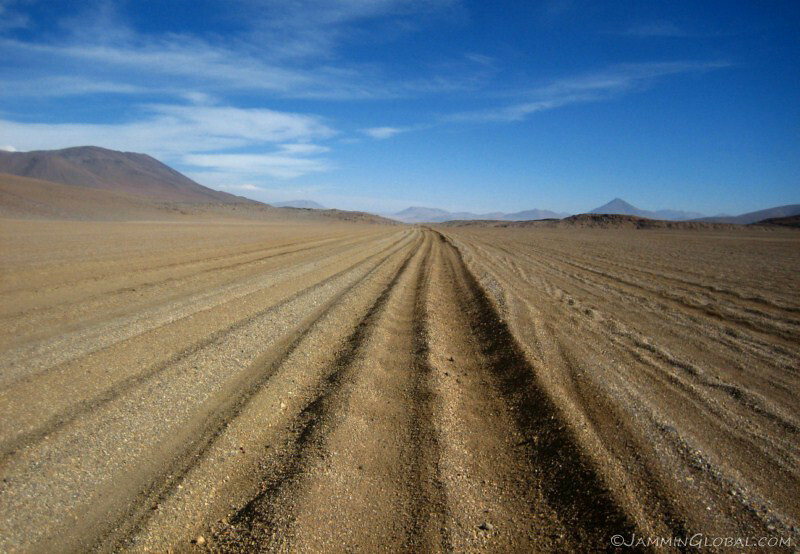 As the 4×4 tracks across the salar slowly pointed towards the railroad tracks, I realized I had to cross them, as I saw the 4x4s doing. 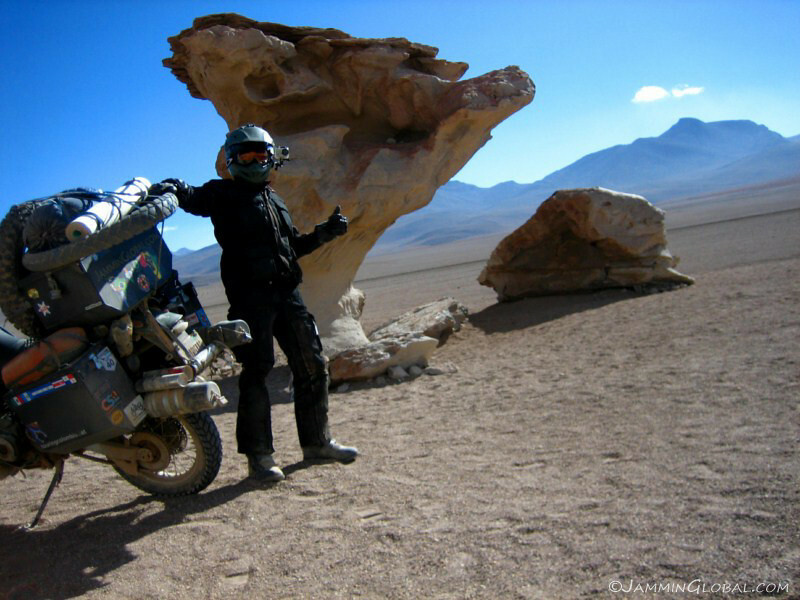 It’s not easy on a heavily loaded bike and I piled up some stones to act like ramps over the rails. 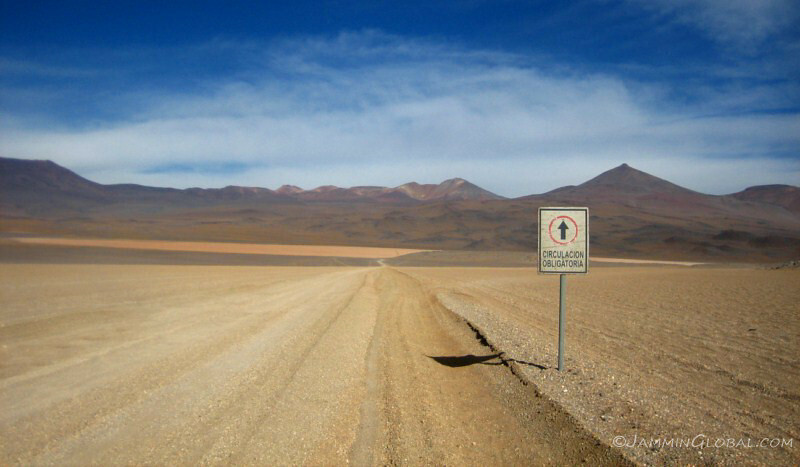 I’m not sure if there’s a proper crossing at some point further west or not, but this sure adds to the excitement. 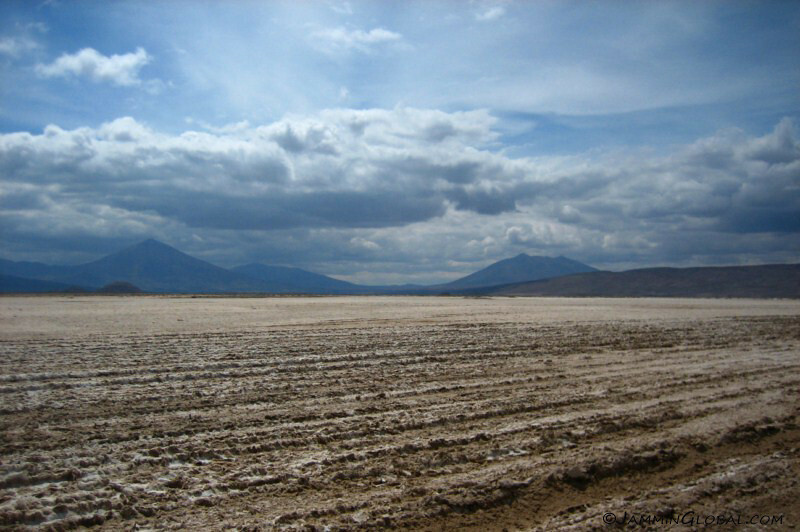 This salar was more muddy and brown compared to Uyuni and I think the rains bring out the dirt in the salt. 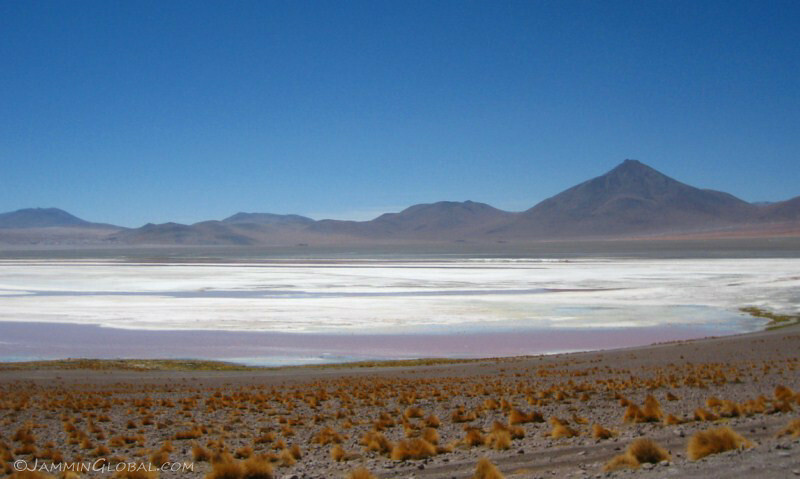 Like this, there are many salars in the area, but all much smaller than the expanse of Uyuni. 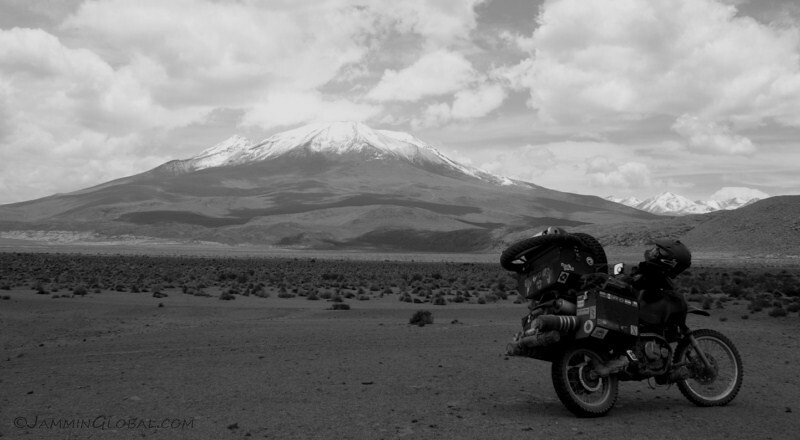 I stood for awhile under this volcano’s gaze and understood why ancient knowledge would have deified these landforms. 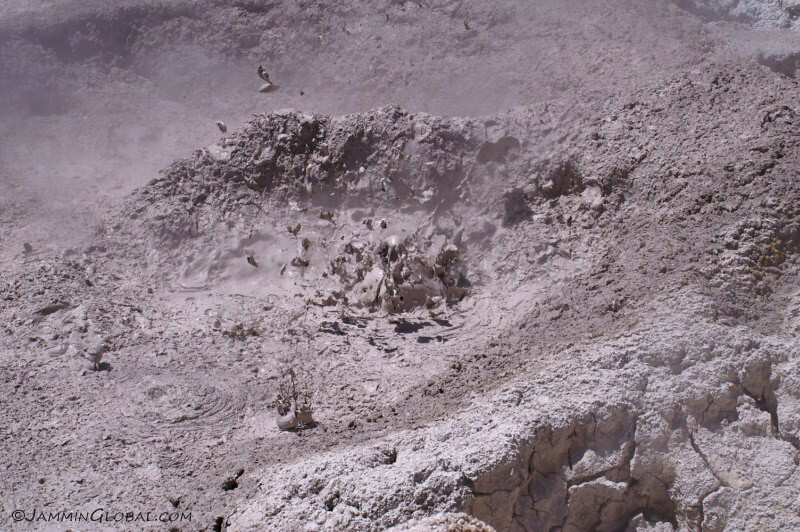 However, their destructive power still commands respect, even in today’s world of more certain geologic knowledge. 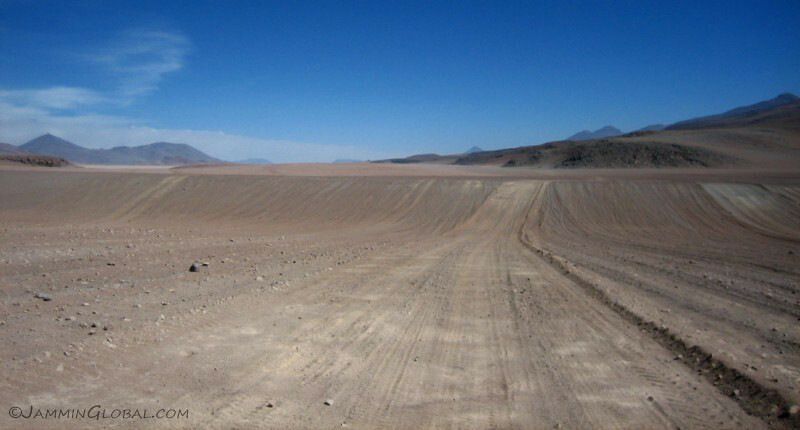 Parallel tracks creating ruts in the mud with the cone-shaped Volcan Chiguana on the left. 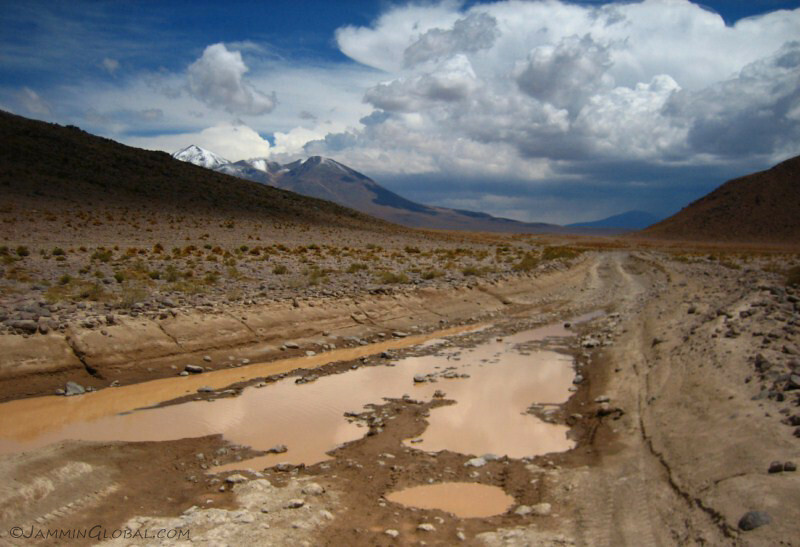 Where the mud has been cleared (like in the tracks), you can see the surface of the salar. 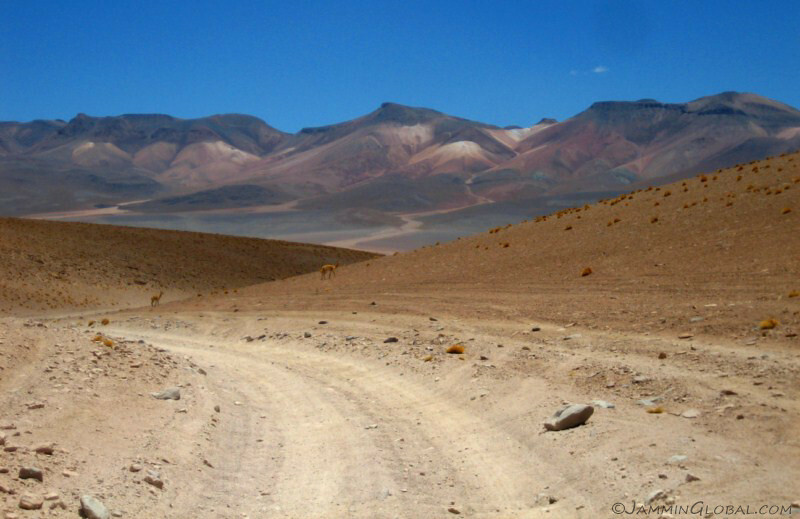 From here, that’s the last of riding on salars and the route starts climbing. 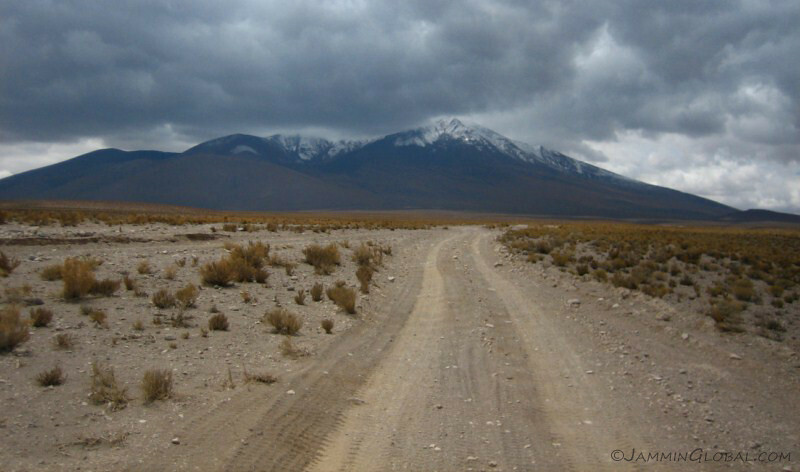 We’re heading to the right of Volcan Coyumichi. 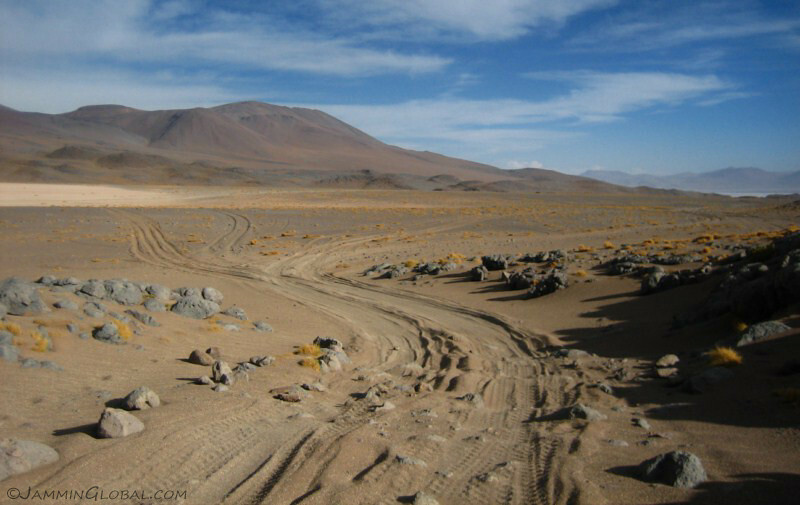 The route turned sandy as we started climbing. 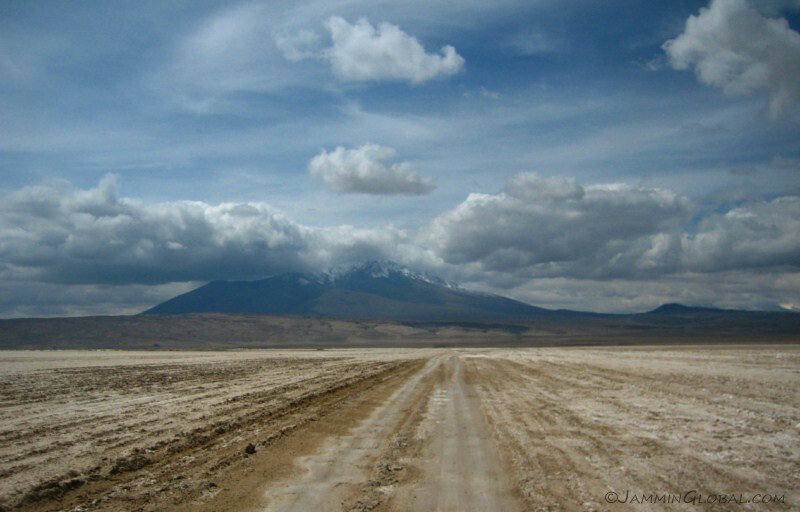 Looking back at the way I came across the Salar de Chiguana with Volcan Luxsar looming over. 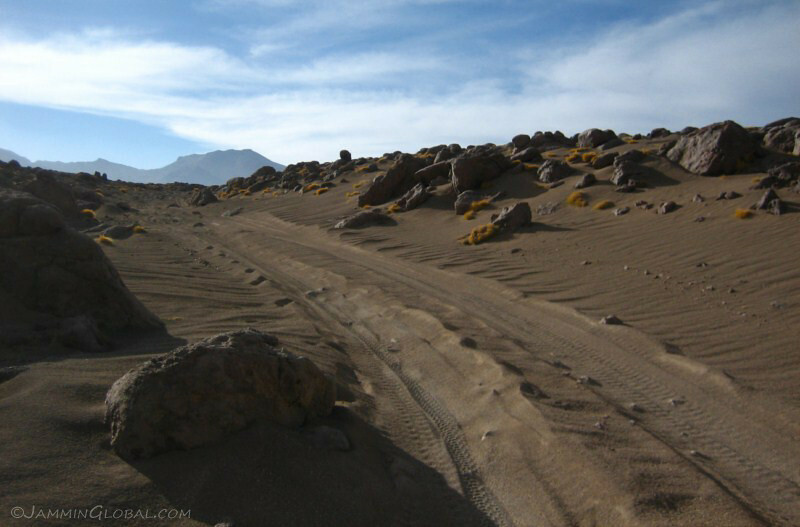 Corrugated, sandy tracks heading towards Volcan Coyumichi. 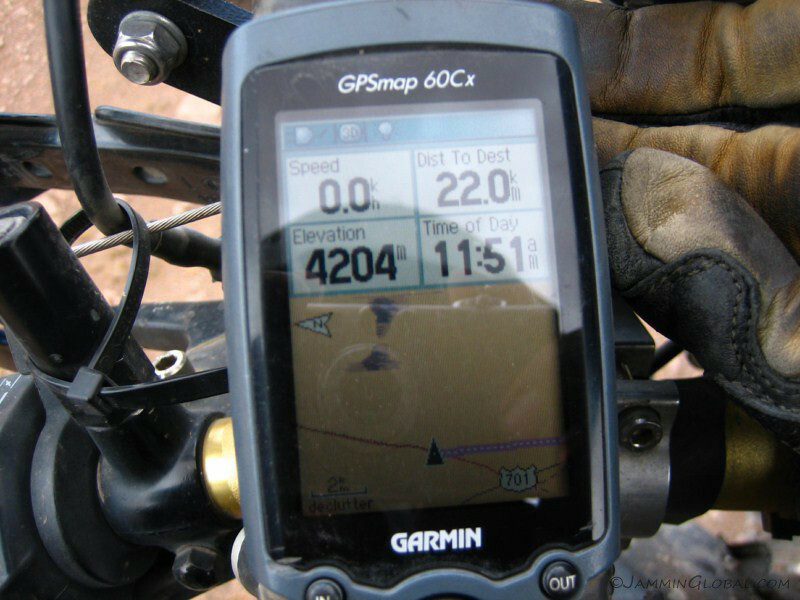 It was steep in places and you can’t stop, but just have to power on over to the top. 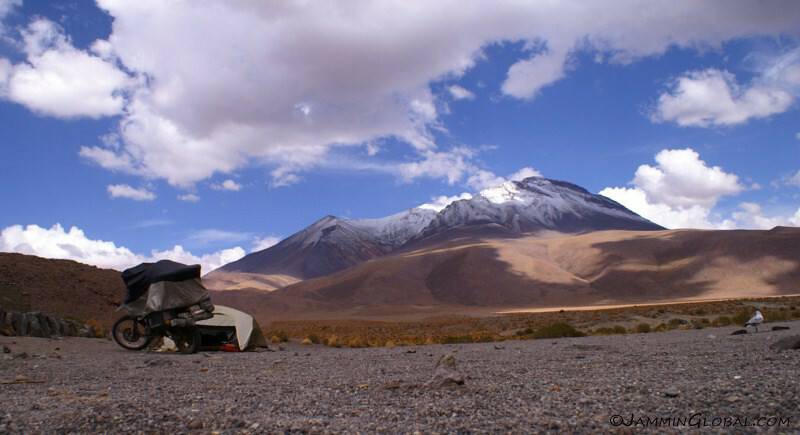 Besides the individual overlanders, the only other vehicles are from the numerous tour groups that ply the route with trusty old Toyota Land Cruisers. 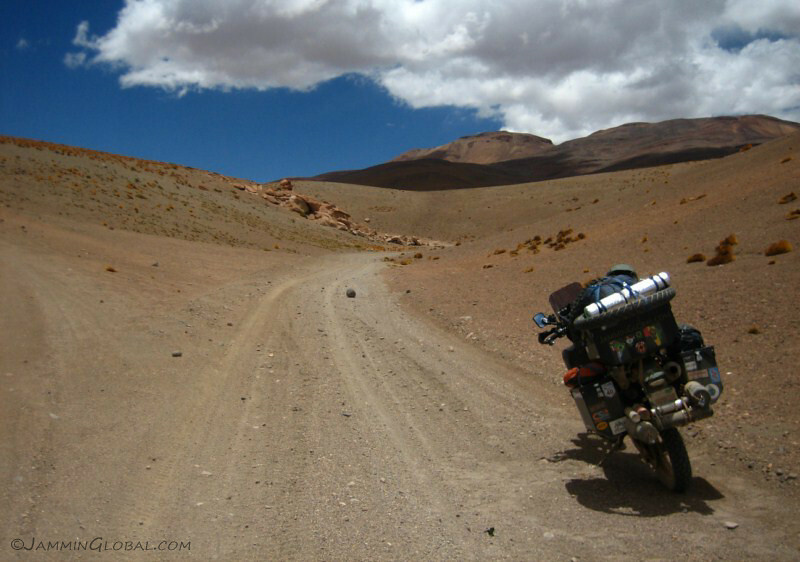 Being a gear head, it was good to see them being used in such tough terrain, as their image is that of a luxury SUV in the US. I got passed by between 10 and 30 jeeps a day, which makes it feel like a busy road at times. Some were nice and stopped to make sure everything was ok and asked if I had enough water. But others were quite rude and just bahn-stormed by, without giving much clearance. 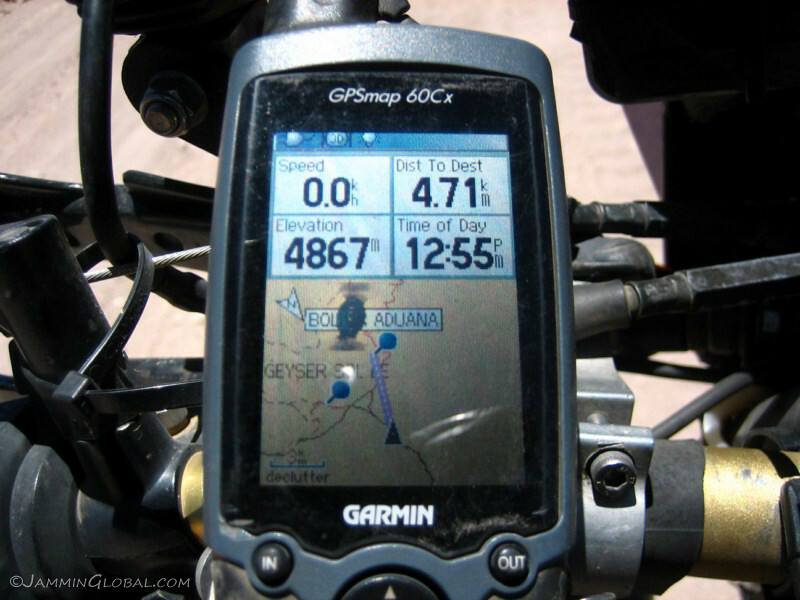 Their fast speed is the primary reason for such deep corrugations along this whole route. 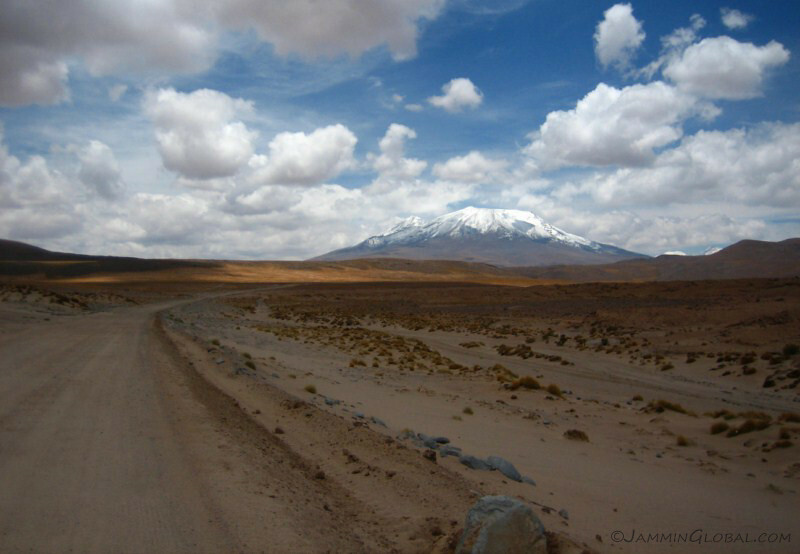 I took frequent breaks and continued chewing coca leaves during this whole route, along with taking the altitude-sickness tablets and had no more headaches. 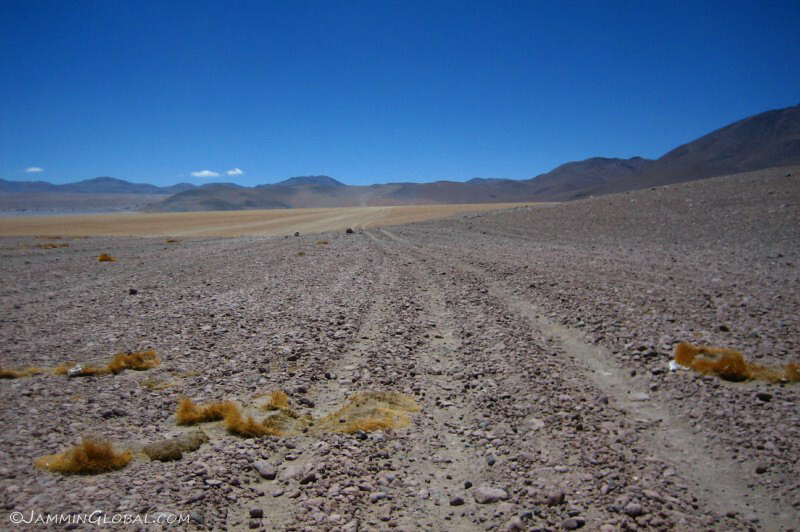 The surface was loose and where the sand had been swept away, loose rocks came through. 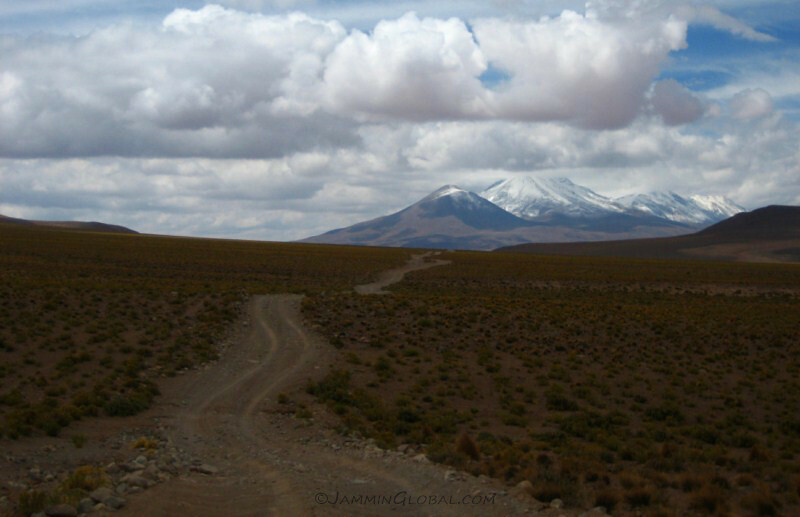 Reaching the top of this pass and getting a glimpse of the route as it headed towards the volcano alley. But before the next break, there were more rocks to negotiate. I had aired down the tires to 12 psi in the front and 18 in the back. 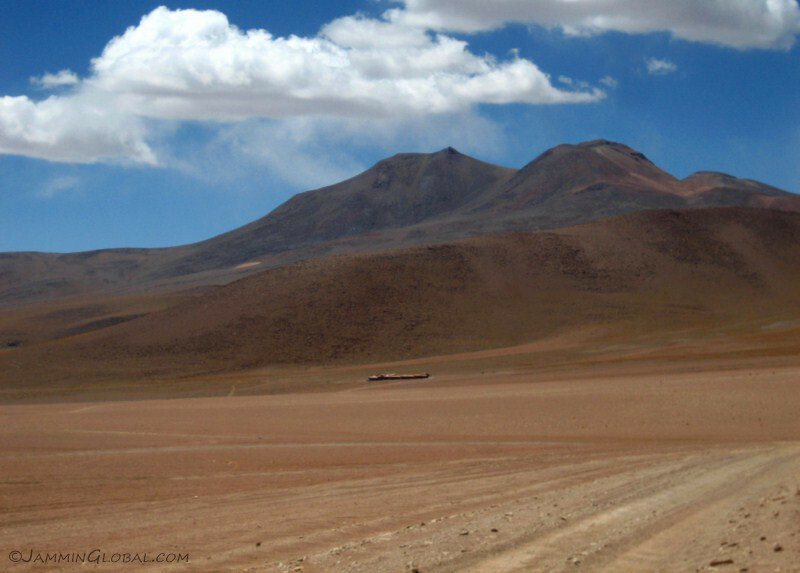 The elevation quickly climbed from around 3,600 m (11,811 ft) on the salars up to 4,200 m (13,780 ft) and would stay up here and go even higher from here on. 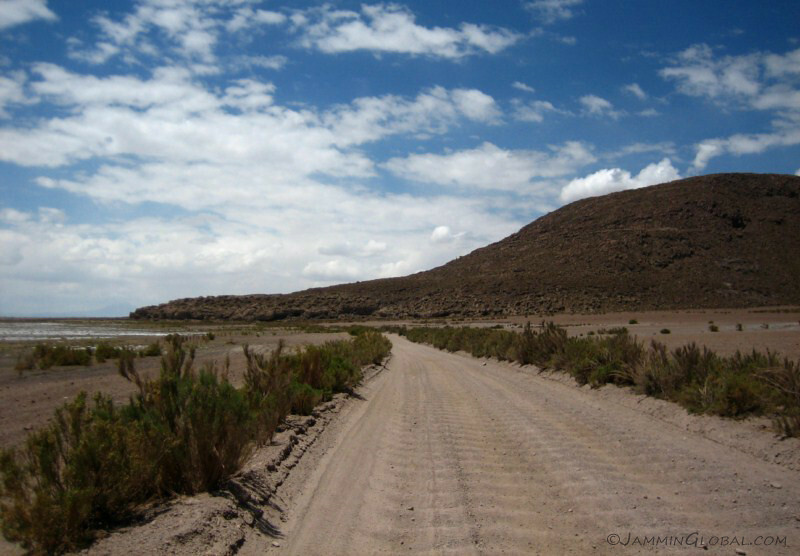 The destination for today was Laguna Cañapa, which was 22 kms away as the crow flies, but more like 32 kms as the bike crawls. 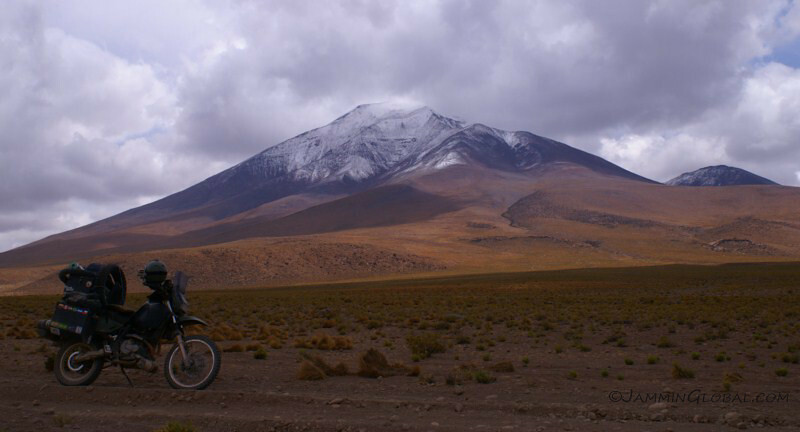 Volcan Coyumichi, standing at 5,850 m (19,200 ft), whose sides looked like an easy climb from here, but I knew that distant slopes are deceptive to the human eye. 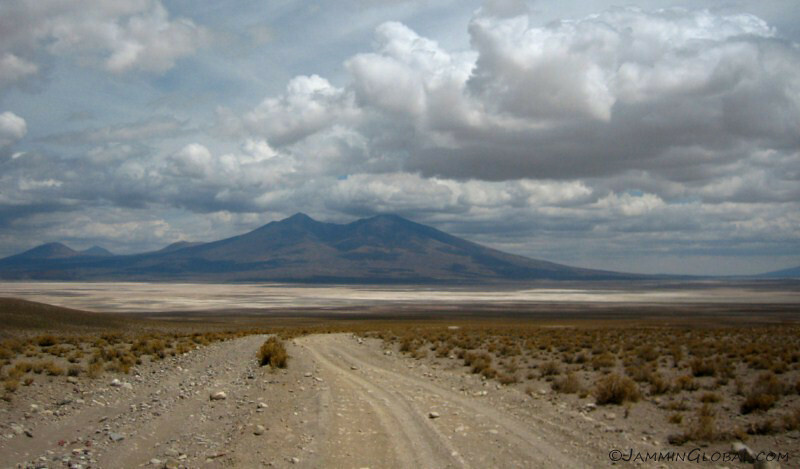 Looking south towards Volcan Callejon. 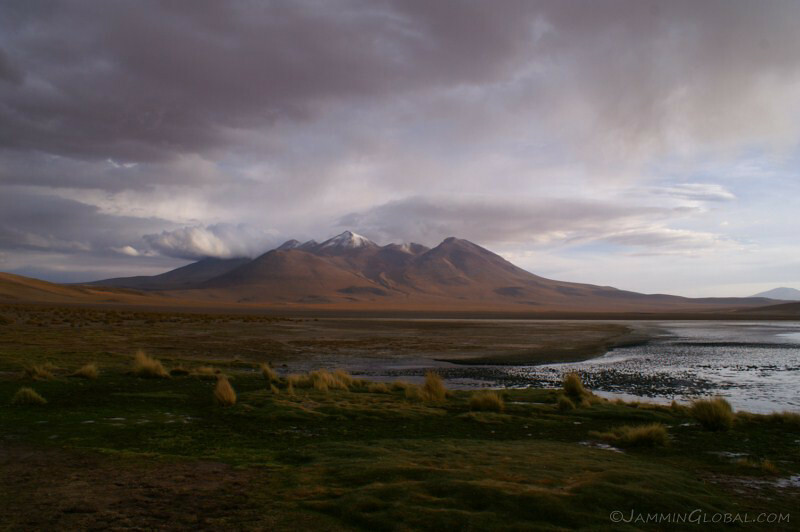 A super-wide panorama of about 270 degrees taking in the snow-capped volcano-studded landscape, starting with Coyumichi on the left, Inti Pasto in the distance with Callejon to its right and finishing up with the active Volcan Ollague, sitting on the border with Chile and which you can ride up the sides of. 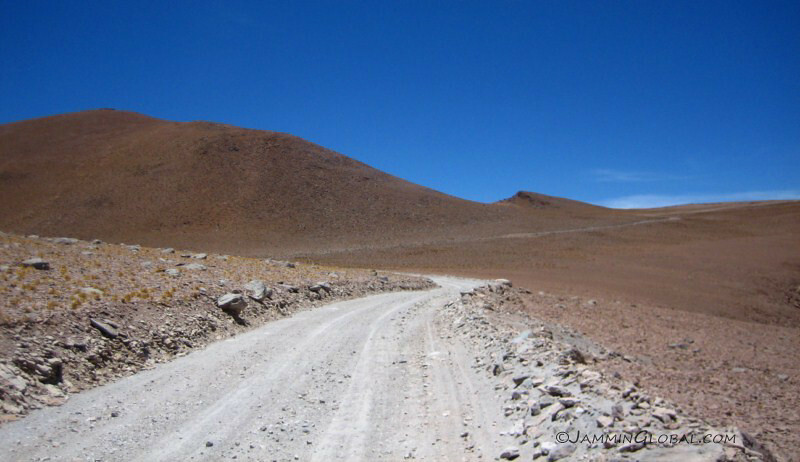 I realized this 4×4 track is a shortcut from Salar de Chiguana over the Coyumichi pass and joins the bigger highway coming down from Ollague. 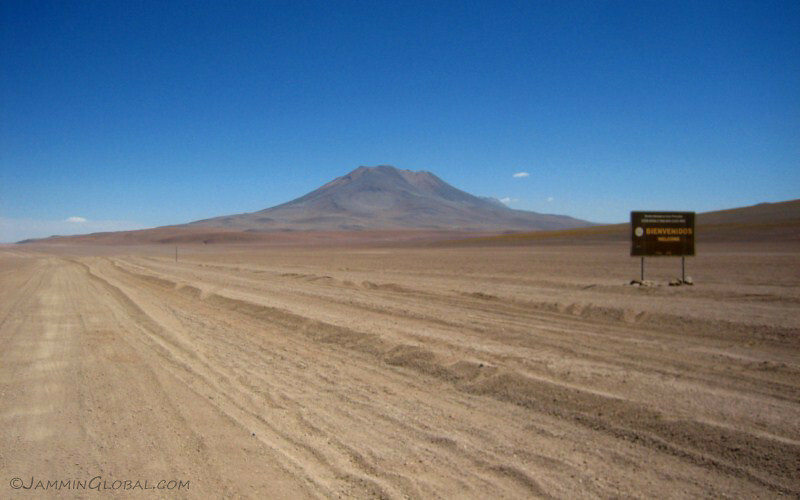 So, there must be a proper railroad crossing if you continue across the salar to Ollague. 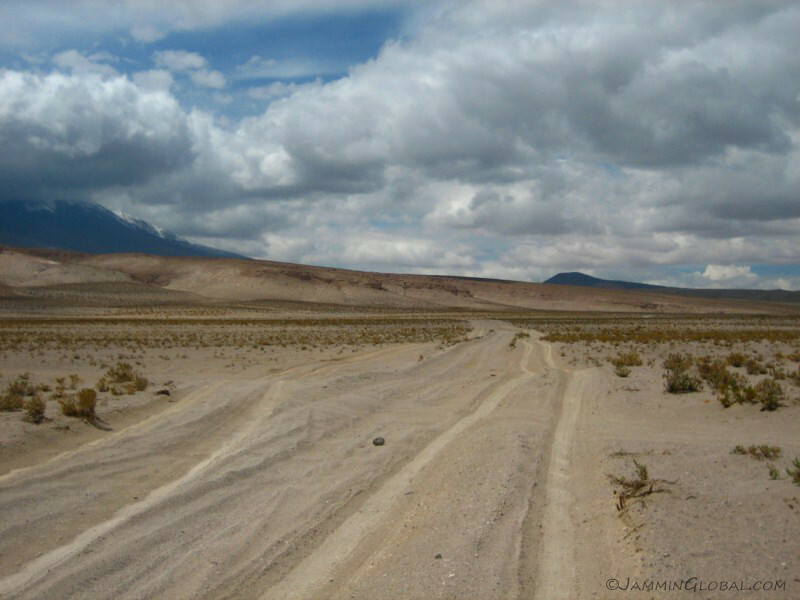 The track joins highway 701, heading from Ollague to San Cristobal and back up to Uyuni, for a short while. 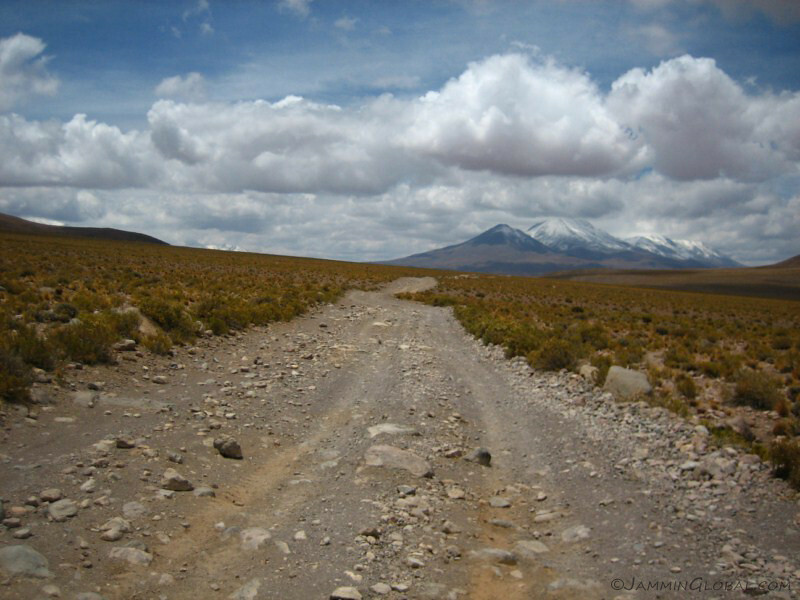 This is also the way to enter the Lagunas Route in the rainy season, when the salars are flooded. 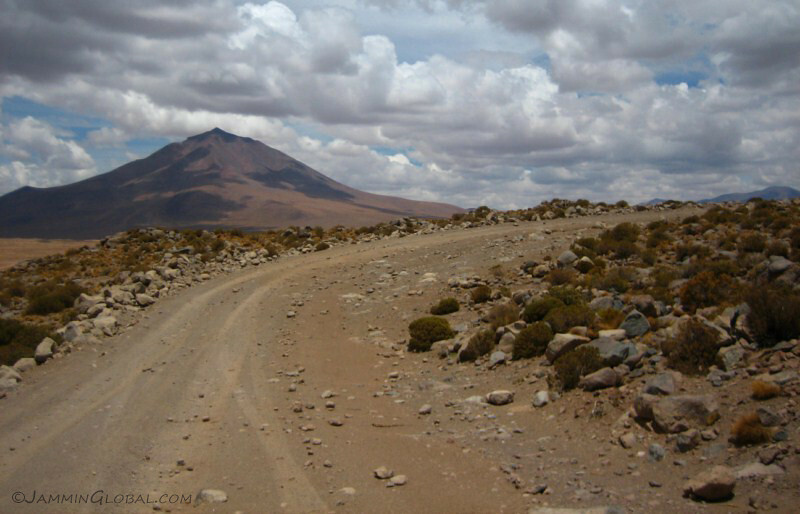 The track splits off and continues south under Volcan Inti Pasto. 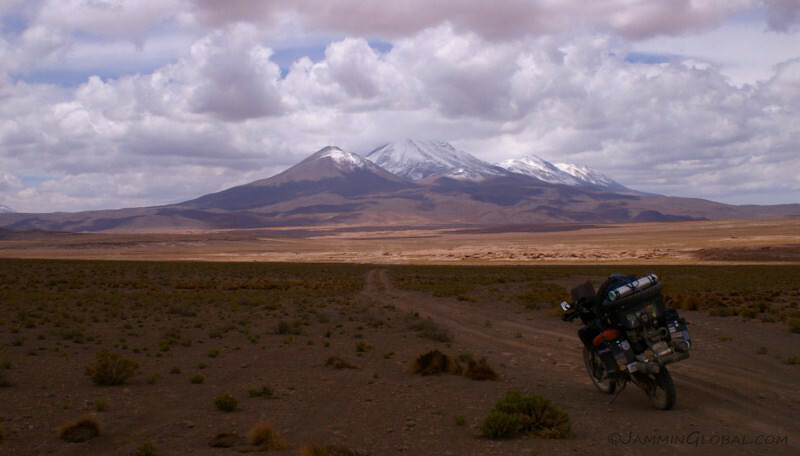 Snow-capped Volcan Inti Pasto, without its cone, meaning it blew up sometime recently (geologically-speaking). 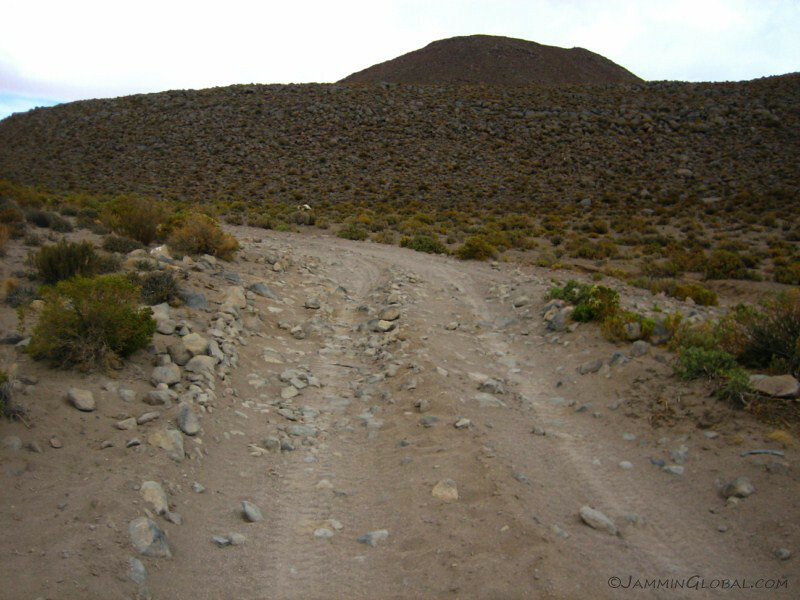 Heading up a rocky track down the alley of volcanoes. 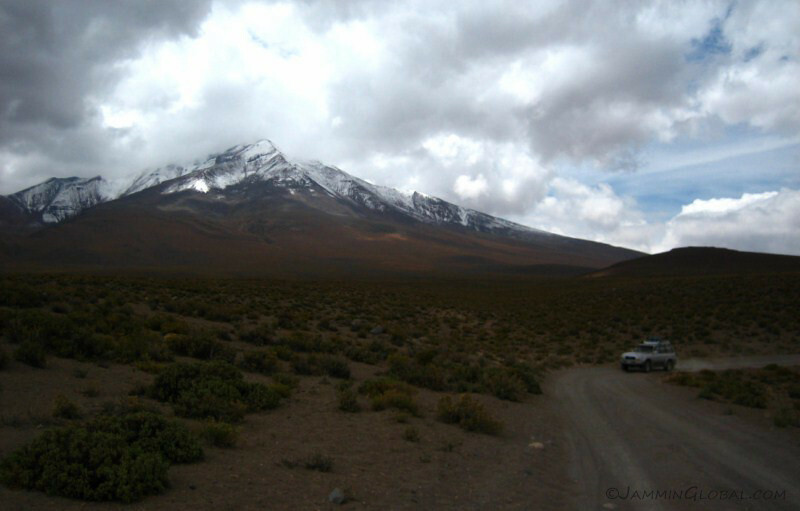 A clear view of Volcan Callejon. 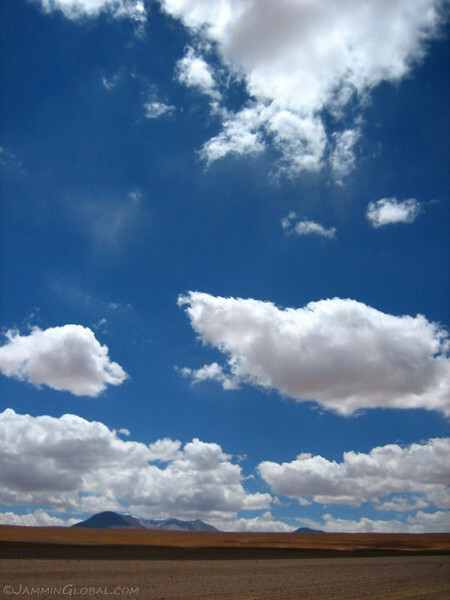 It can’t be overstated how clear the air is at this altitude. With most of us living near sea level, we’ve gotten used to a haze in the skies (either from pollution or just water vapor from the seas) and the clarity of the sky is stunning for us low-dwellers. 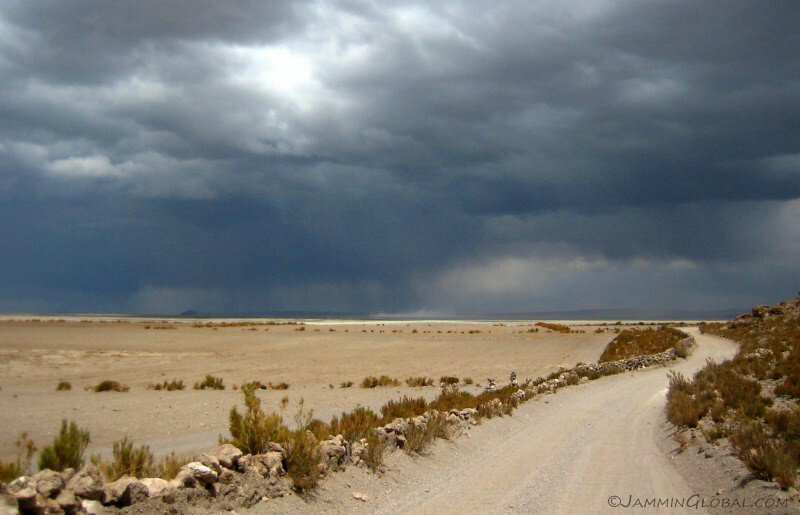 Evidence of the rainy season beginning and dark clouds were looming further south. 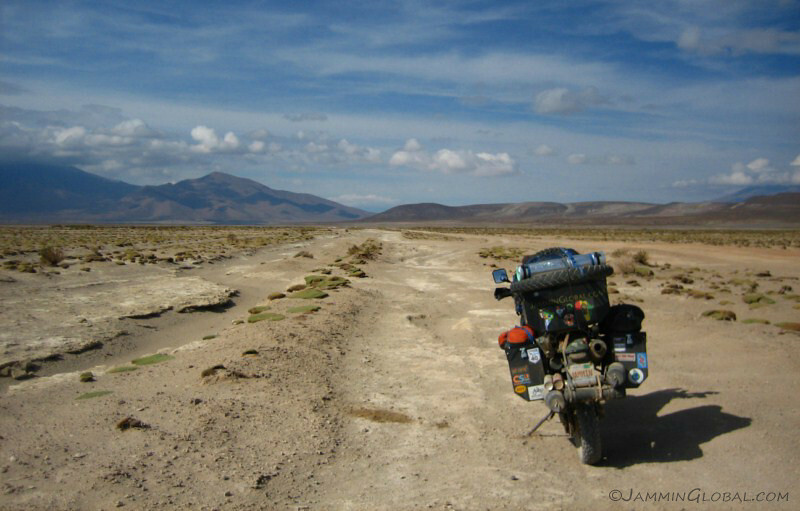 I turned the corner and arrived at Laguna Cañapa, the first of the lagunas on this epic route. 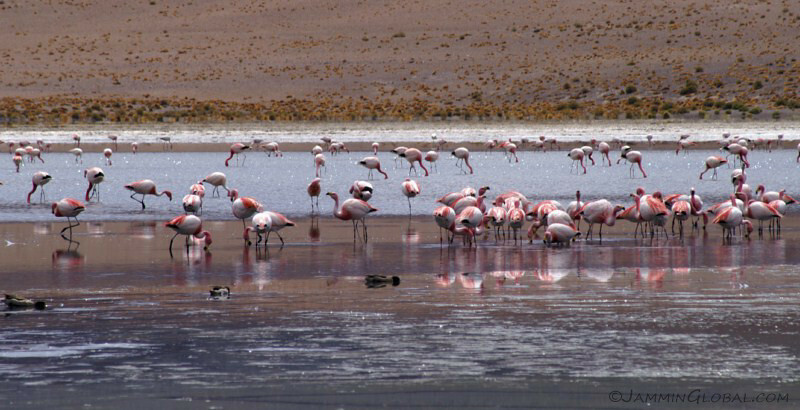 Flamingoes munching away on krill-like food and algae that grows well in these saline lakes. 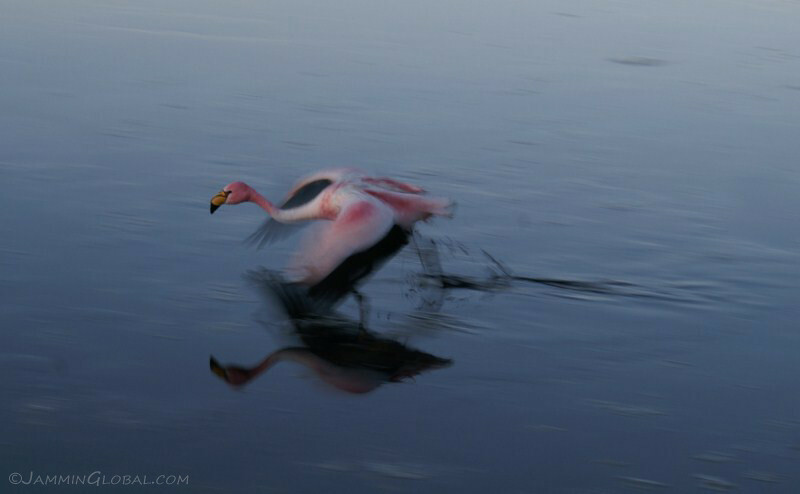 There were about three-different types of flamingoes in the lagoon and most of them had their head under water, constantly nourishing on the algae. The peet-moss at the edge of lagoon was soft and mushy and smelt of decaying organic matter. 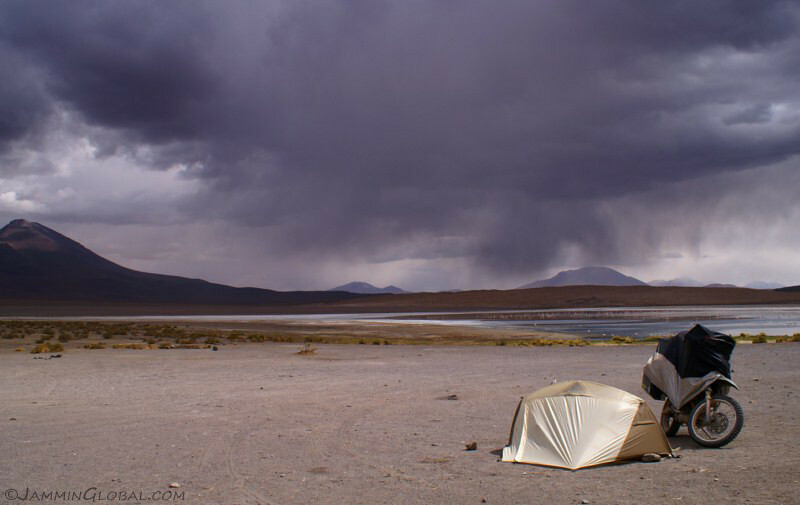 I arrived around 2 pm and upon seeing this rain front moving west across the route, I decided to camp here and take it easy. The weather would probably be better in the morning. 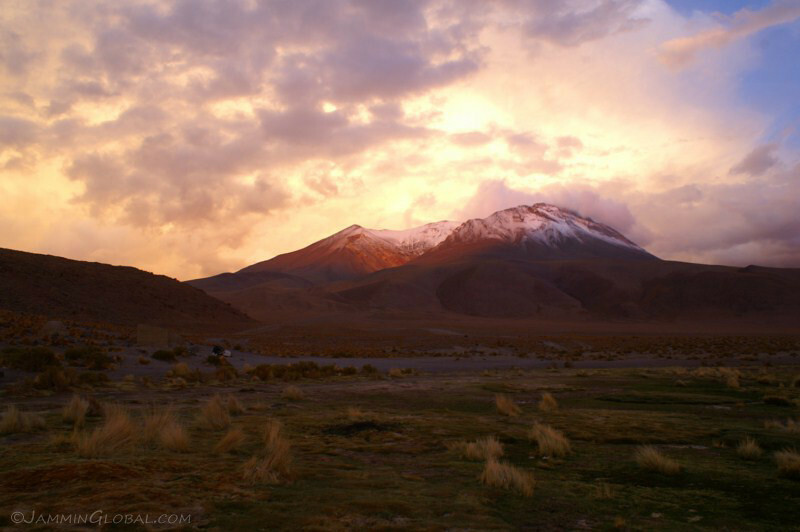 It was a spectacular place to camp, at 4,150 m (13,616 ft) next to a salt lagoon and under a snow-capped volcano. 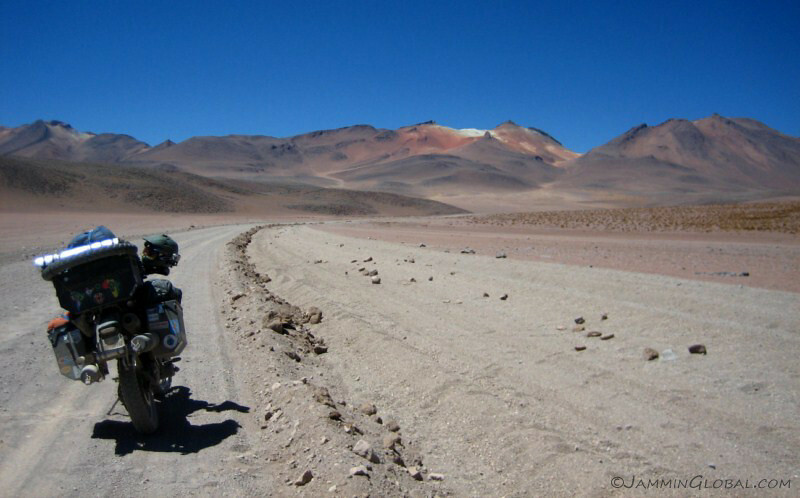 All the hardships of the route were worth it for experiences like this. I setup my shelter and got the cover on sanDRina just as the first few drops fell. I tucked in to escape the cold and the wind and laid down to relax by listening to an audiobook from Arthur C. Clarke. It was his first novel, The City and the Stars and its futuristic setting of a global desert landscape seemed quite appropriate. 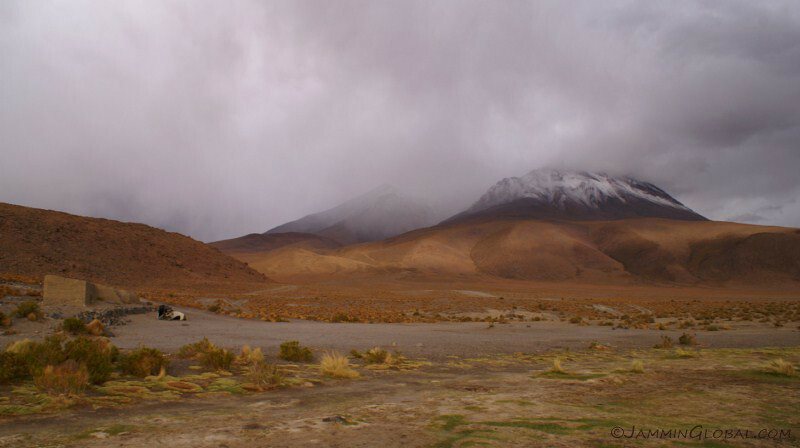 I got up around 4 pm and noted not much rain had fallen, even as the rain clouds passed over head, but the cold winds were still present. 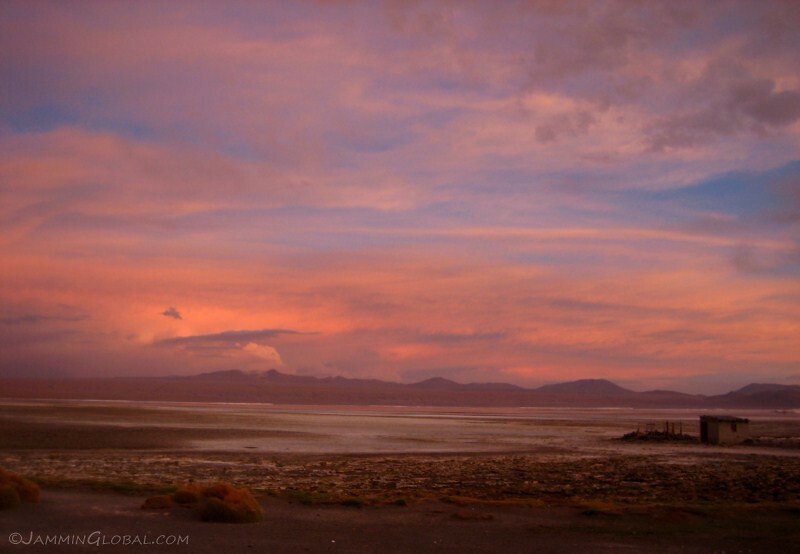 It was interesting to see the changing colors of this stunning landscape. 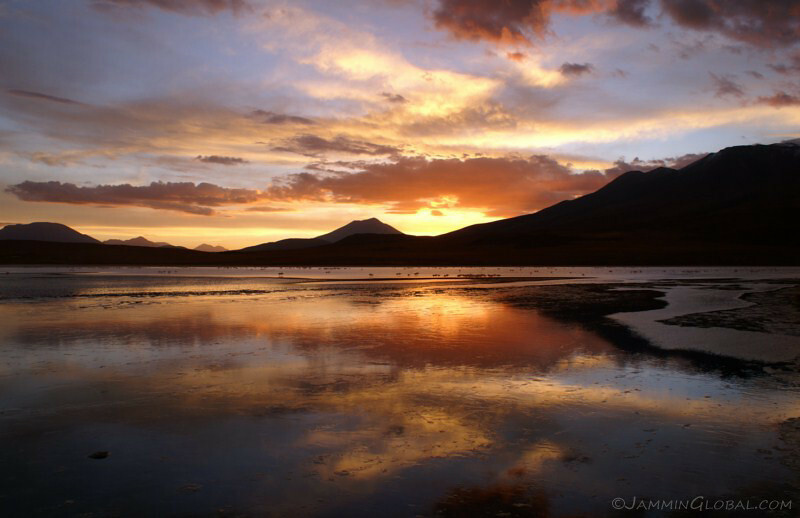 The moment after the sun dipped out of view with the glowing sky reflecting on Laguna Cañapa. 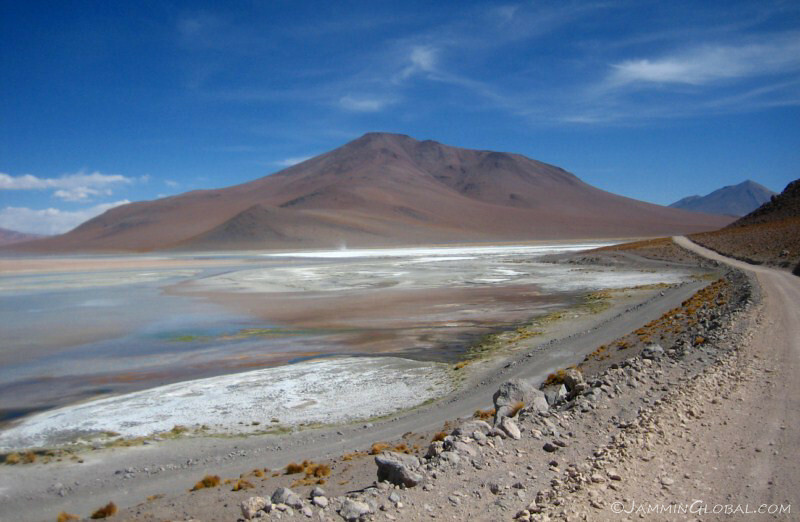 The fact that I was the only human being for miles around in this remote mountain landscape, surrounded by such breath-taking beauty made me feel one with Nature as opposed to being lonely and seeking human companionship. 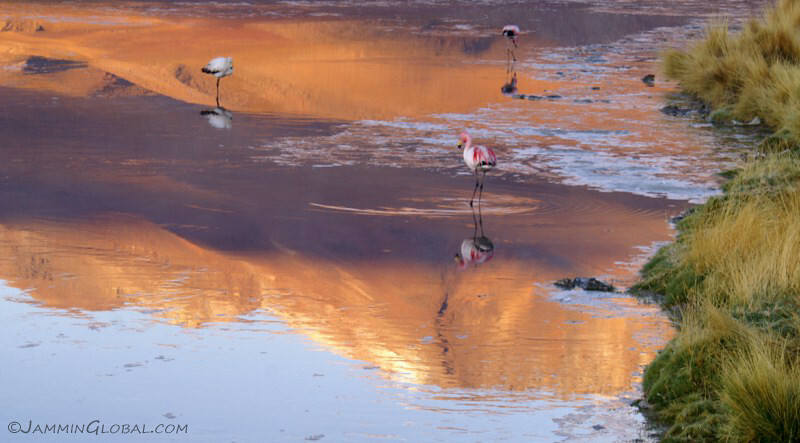 The flamingoes standing in the golden water. 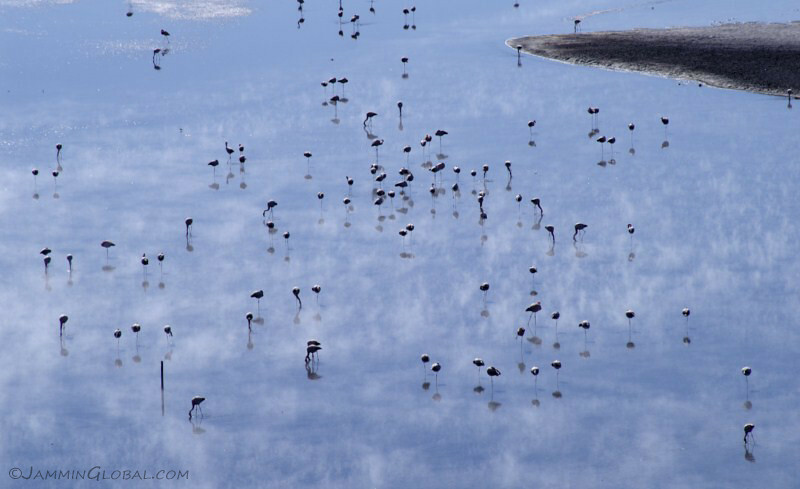 It’s amazing to think how they survive the cold as they don’t leave for the night, but are ever-present in the lagoon. 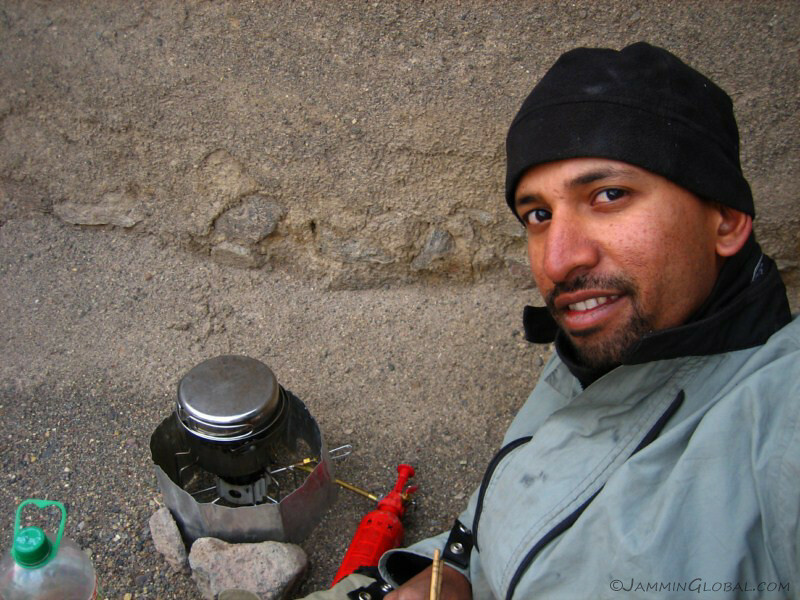 Being comfortable (having water, food, shelter and means of mobility) in a remote setting can nurture the impression that instead of seeing Nature as an enemy to do battle with, it is the essence that we come from. I don’t believe in supernatural forces, only natural ones. 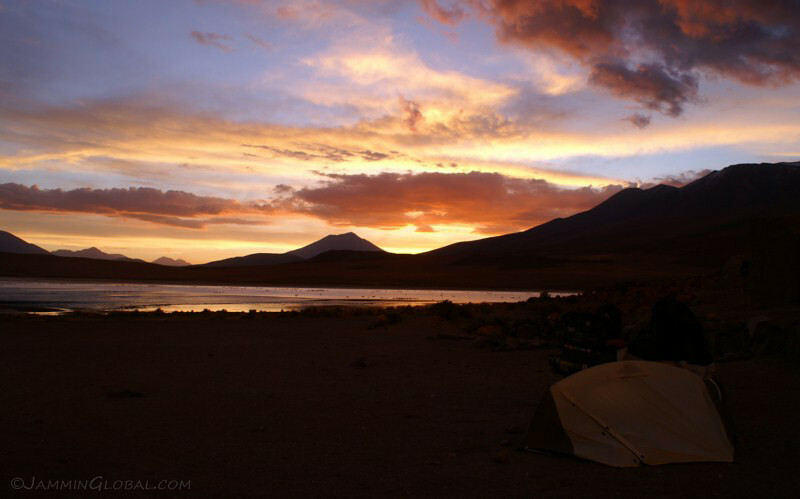 Laguna Cañapa, the most remarkable place that I’ve camped at. There were some abandoned rock and mud structures nearby and I found a corner to escape from the wind and get some water boiling for ramen noodles. 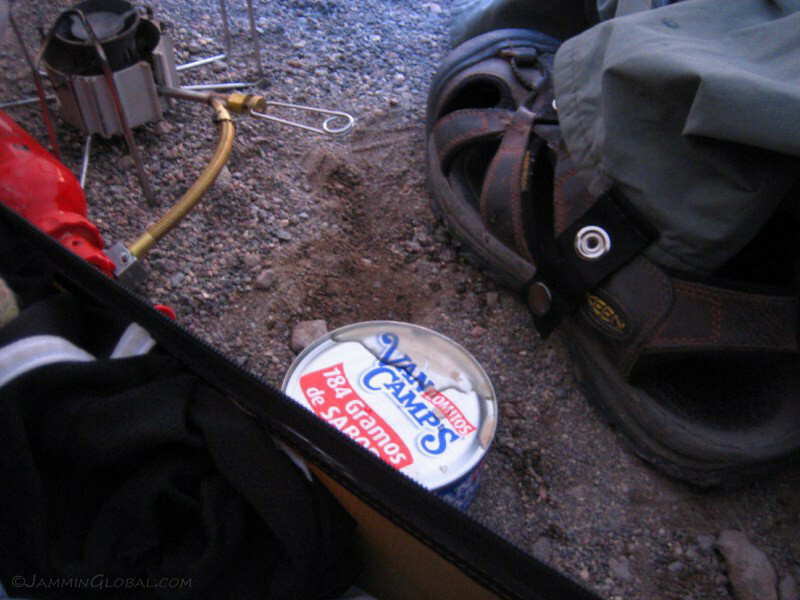 I bought this can of tuna in Santa Cruz, at an elevation of about 400 m (1,300 ft) and didn’t think twice before piercing its top at 4,150 m (13,616 ft). The pressure difference resulted in a spray of tuna juice. 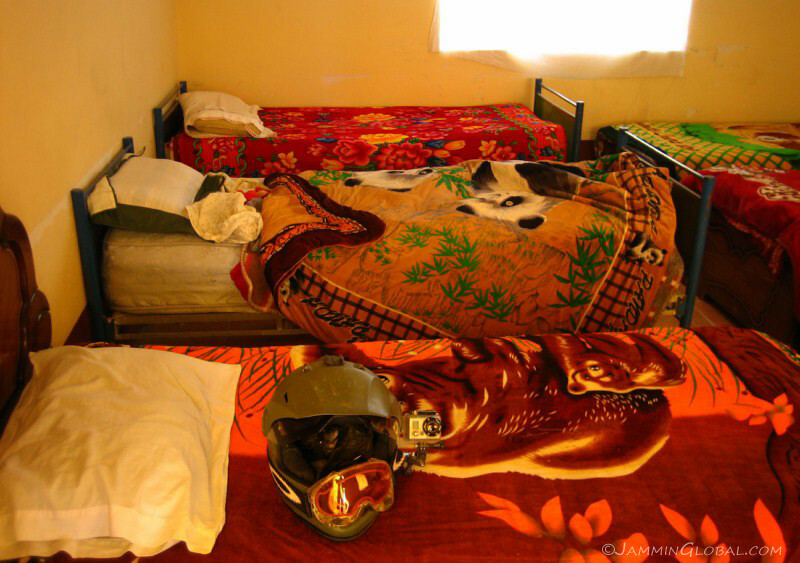 It wasn’t that bad, but now the smell was on my sleeping bag and other pieces of gear. 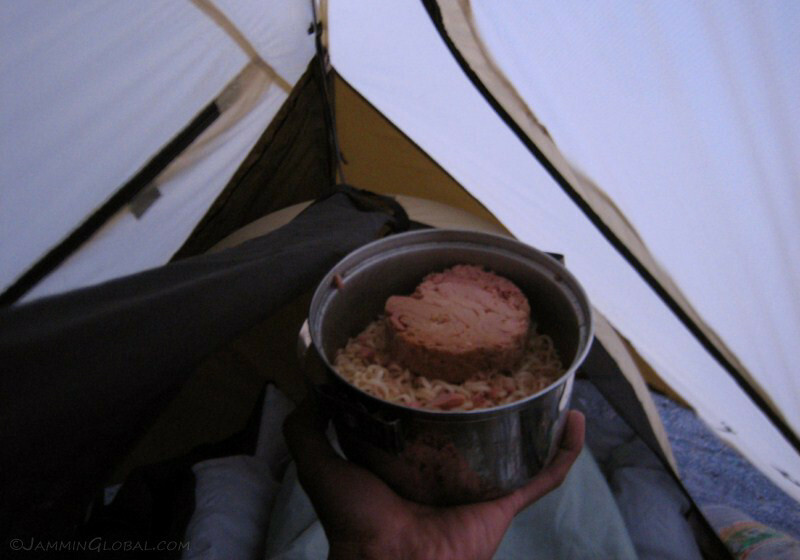 A pretty hearty dinner of ramen noodles and tuna steak. 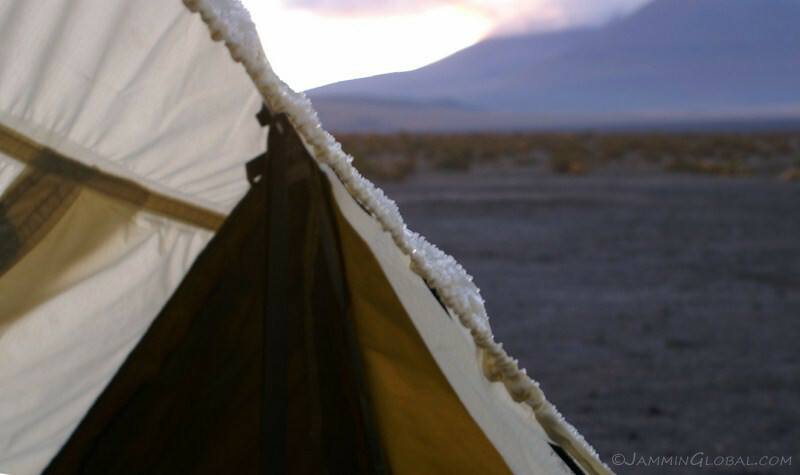 Waking up for sunrise and noting the frost on the tarp. I was pleased with how warm the Catoma Twist kept me, even though it’s not a sealed tent. 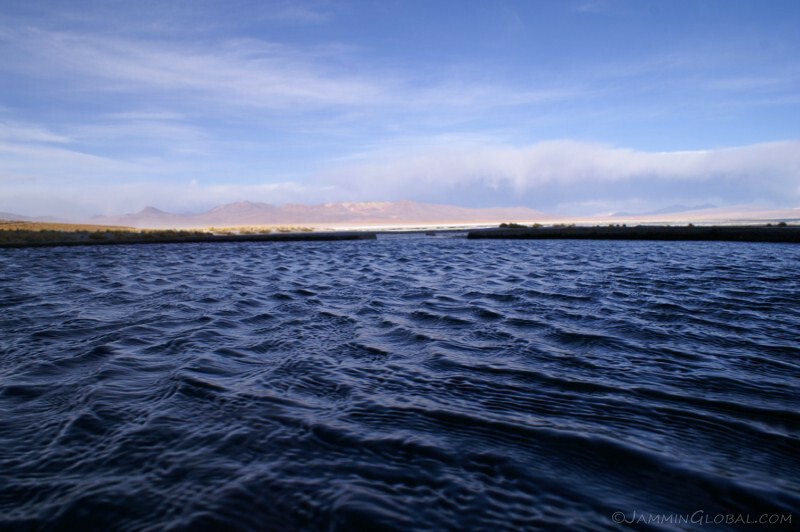 A wide angle view of Laguna Cañapa as the sun’s rays slowly come over the horizon. The full moon was just about setting in the west. 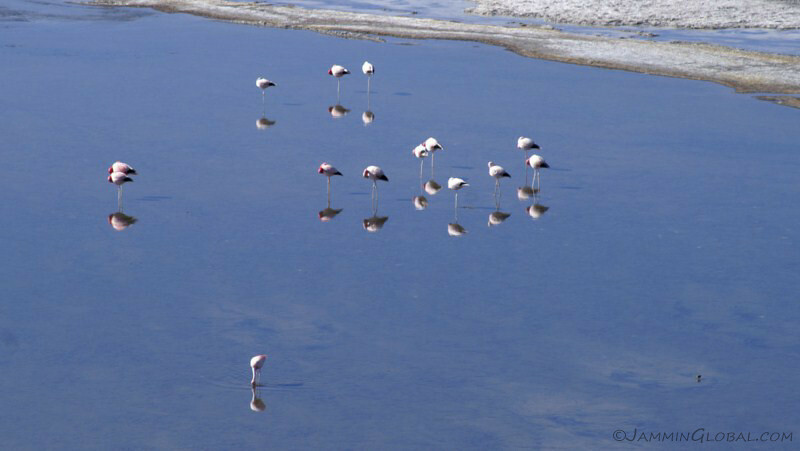 Sturdy flamingoes plying the lagoon for tasty bacteria. There wasn’t much movement among the birds, but I was ready when this chap was cleared for take-off. He generated enough lift to appear like he was running on the water’s surface. 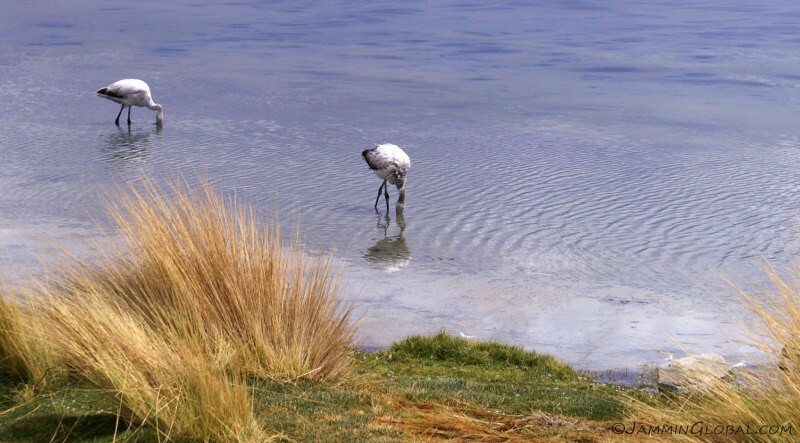 And just as it looked like he was about to rotate and lift off, he aborted and came back into the lagoon to hang with some other friends on this side. I think this is the definition for ‘steel blue’. 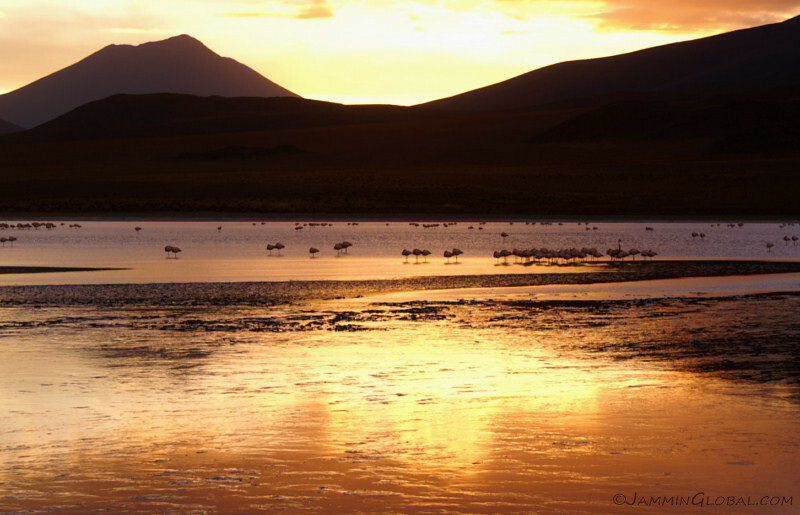 The risen sun now warming up all the flamingoes and the landscape. 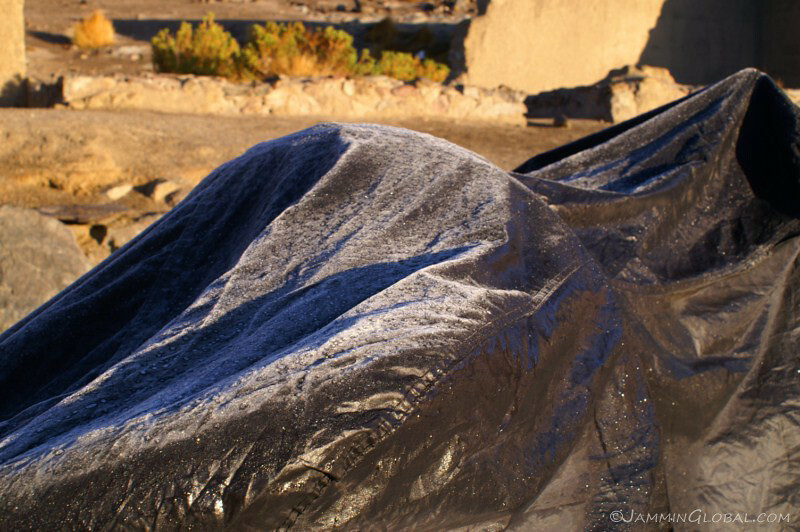 The bike cover protecting sanDRina from the frost.